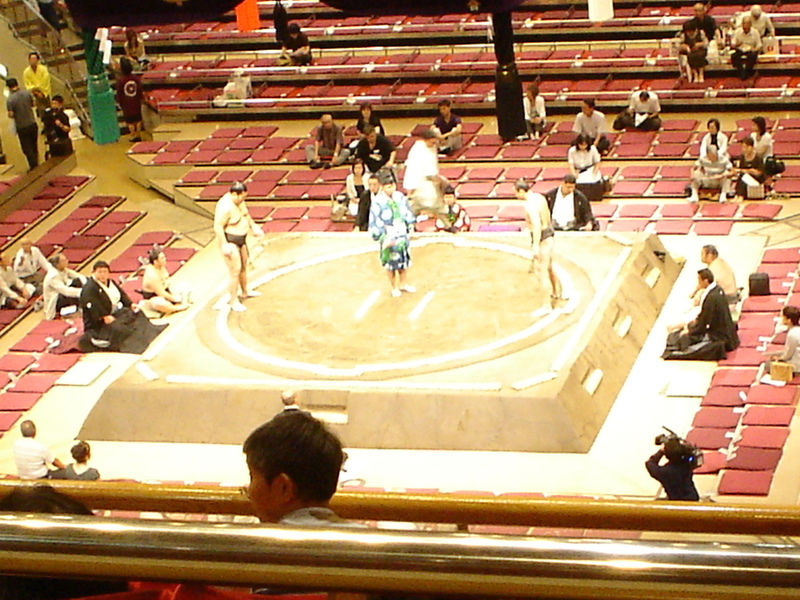 On September 13, 2010, I attended my third sumo tournament of the year. 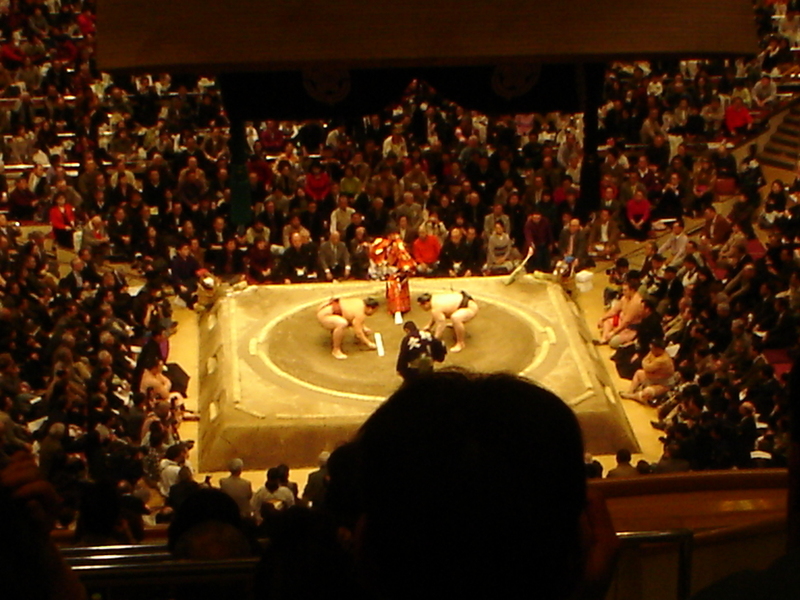 There are 3 sumo tournaments in Tokyo each year, with the other 3 being in Osaka, Nagoya and Fukuoka. 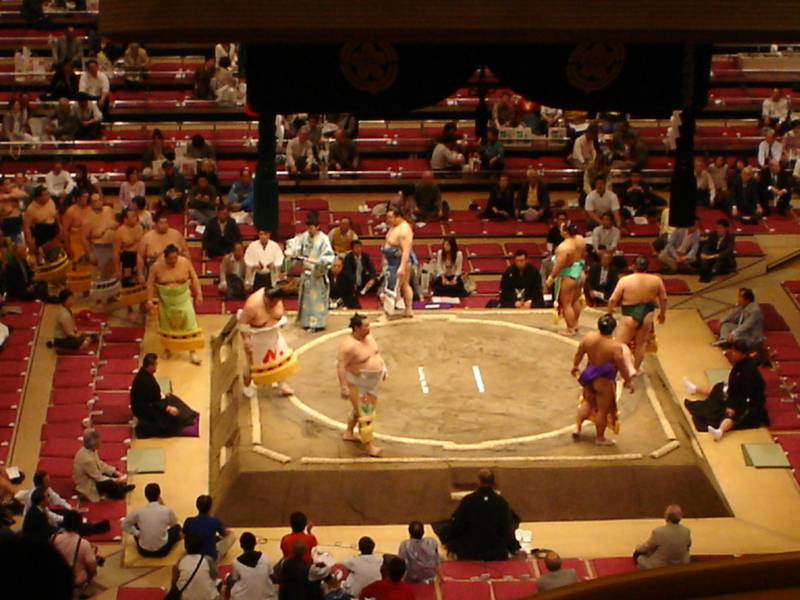 This is the first tournament after the return of the suspended sumo wrestlers. 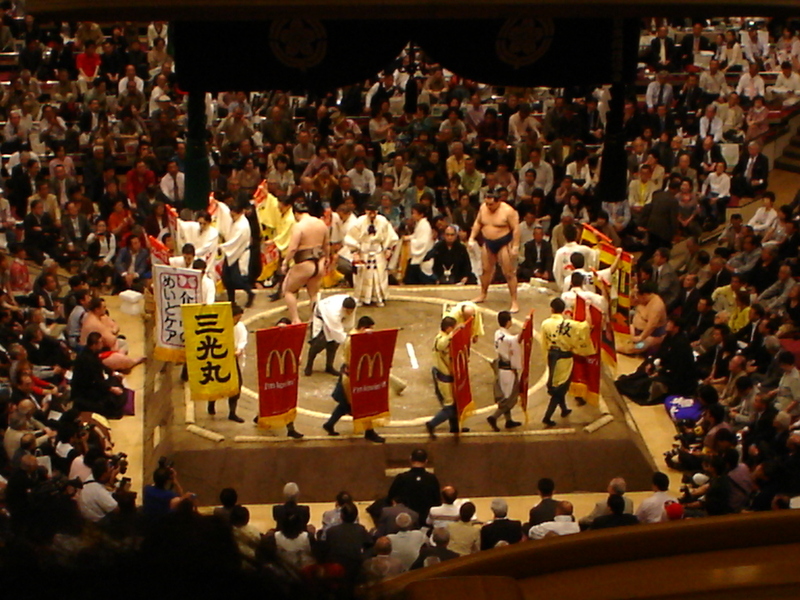 As I mentioned before, those sumo wrestlers were suspended because of illegal gambling on baseball. For this tournament, I was seated even closer than I had been before. Directly in front of me was a walkway, so I had no one sitting in front of me to block my view. This day had a little excitement. 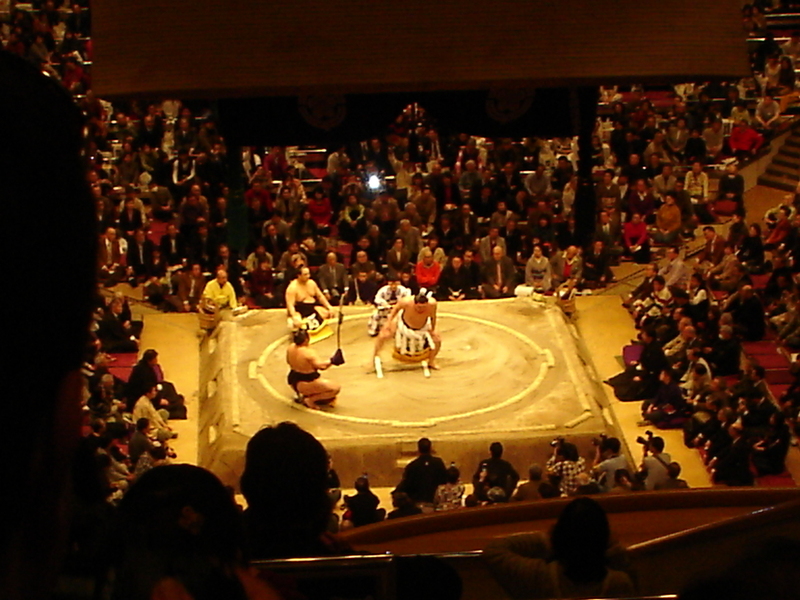 First was a crazy fan of the sumo wrestler Hakuba. He was shouting and cheering Hakuba’s name, and even ran a quarter of the way around the arena to try to get Hakuba’s attention. Down below, you can watch a video of this fan. Also, I happened to see 3 retired sumo wrestlers that I recognized quite well. First was Tokitsuumi, who is now the head coach of the Tokitsukaze stable. Then I saw Kitazakura, one of my favourites who retired this year. He was well known for throwing large handfuls of salt. And finally, I saw Takasago, the head coach of the Takasago stable, which was Asashoryu’s stable. Tokitsuumi was the only one to walk directly in front of me. But the biggest thing was when I arrived. I arrived at the same time as Goeido, a young sumo wrestler who is thought to be the next best hope to become Yokozuna in the future. Anyway, enjoy the pictures and videos! 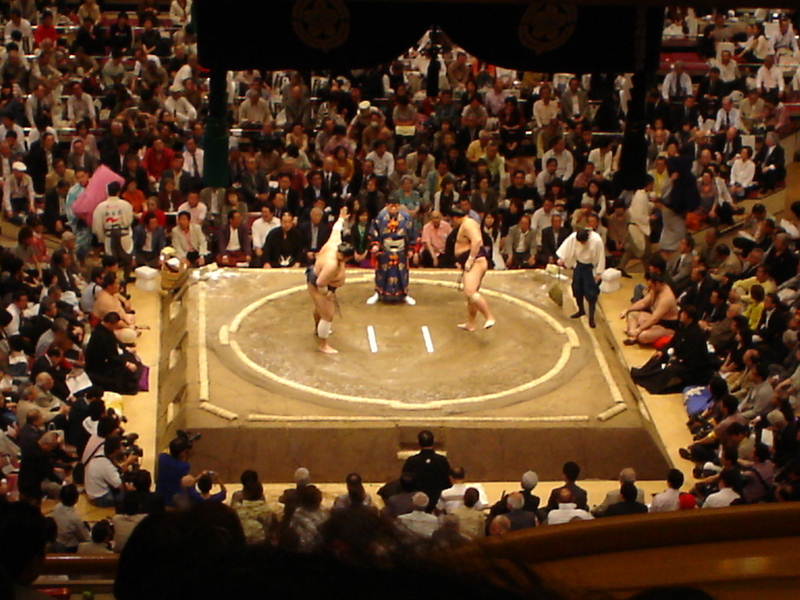 This is a Makushita division match. 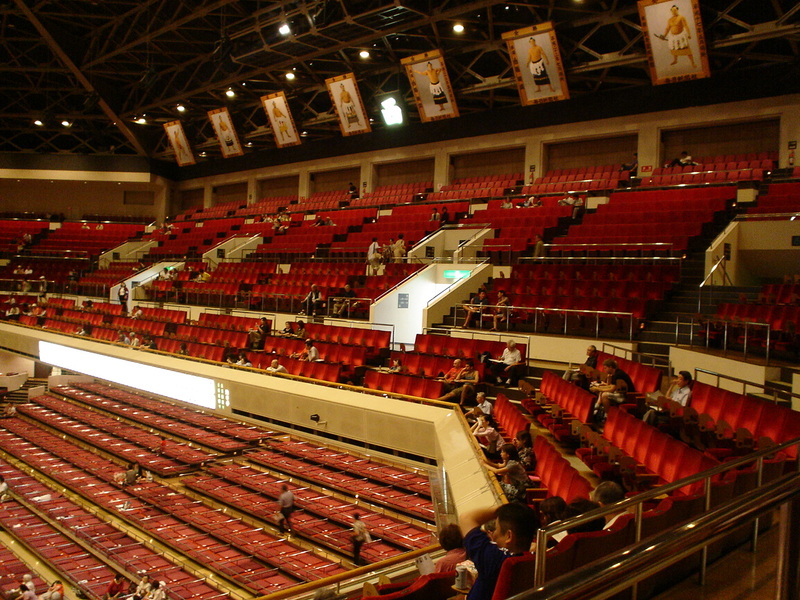 The lower seats are mat seating, while the upper seats are stadium seating. I always get stadium seats. This is my view at this tournament. It's closer than ever. This is the ceiling. It looks like pretty much any indoor arena. This is Takamisakari versus Mokonami. 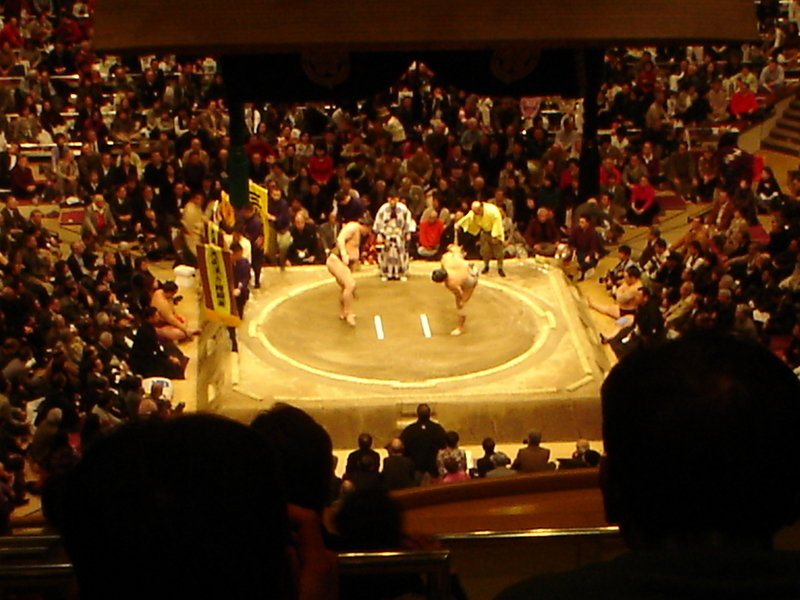 Takamisakari won. Takamisakari is a big fan favourite, because of how he acts. After this match, I got to watch the crazy Hakuba fan. Here’s the video I took of him. 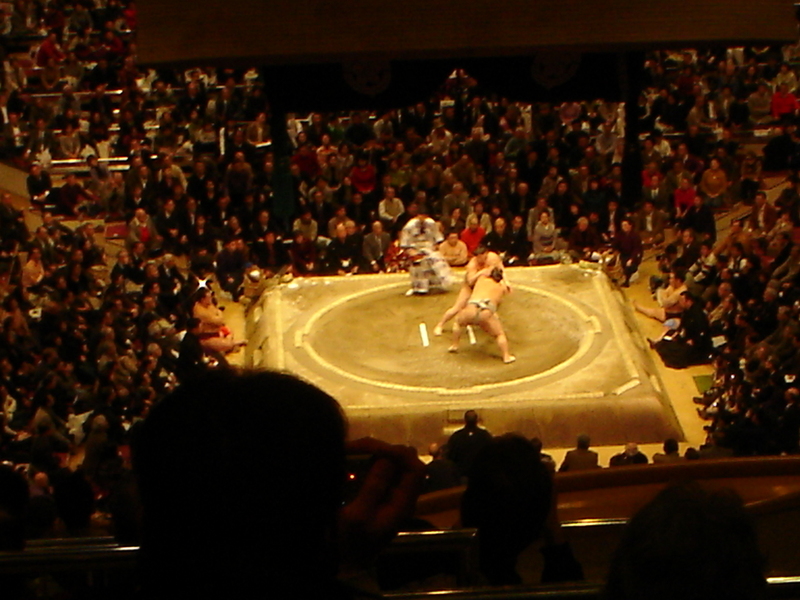 This is Tokusegawa versus Tochinoshin. 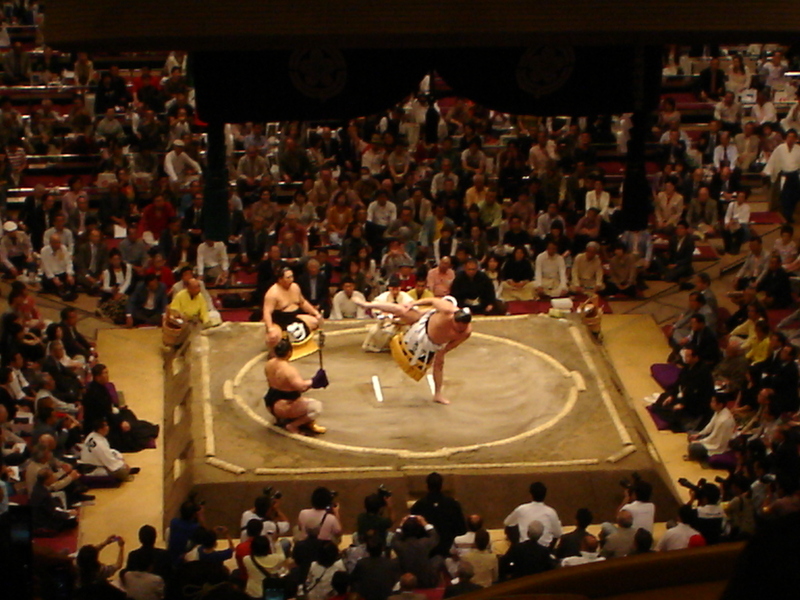 Tochinoshin won. This is Sekiwake Aran versus Kotoshogiku. Kotoshogiku won. 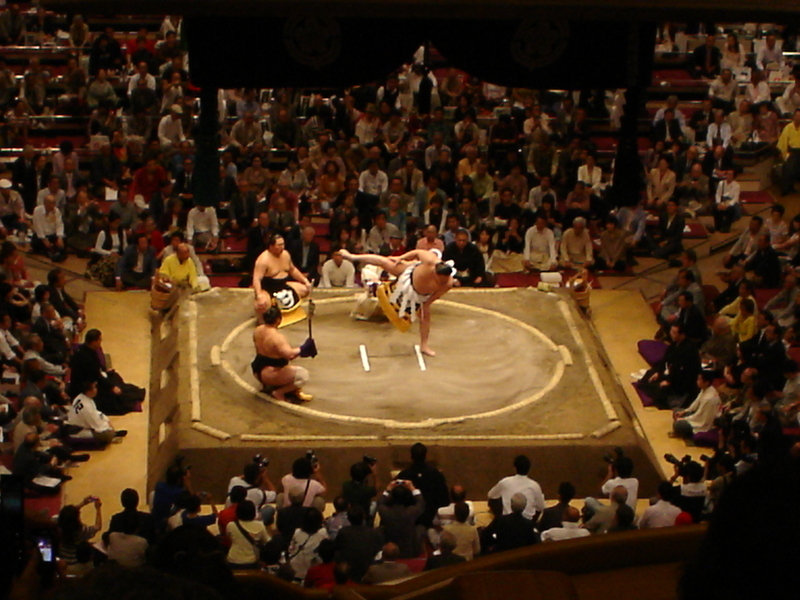 This is Kyokutenho versus Sekiwake Tochiozan. Tochiozan won. 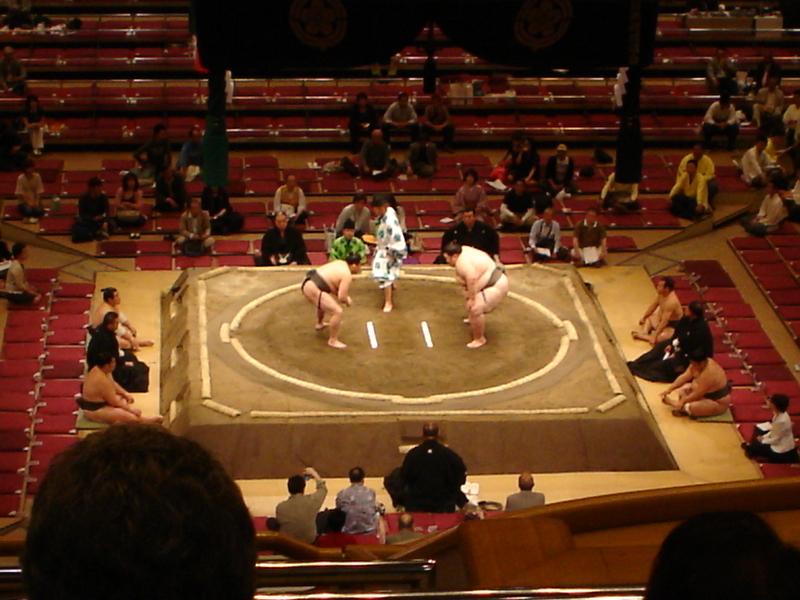 This is Ozeki Harumafuji versus Homasho. 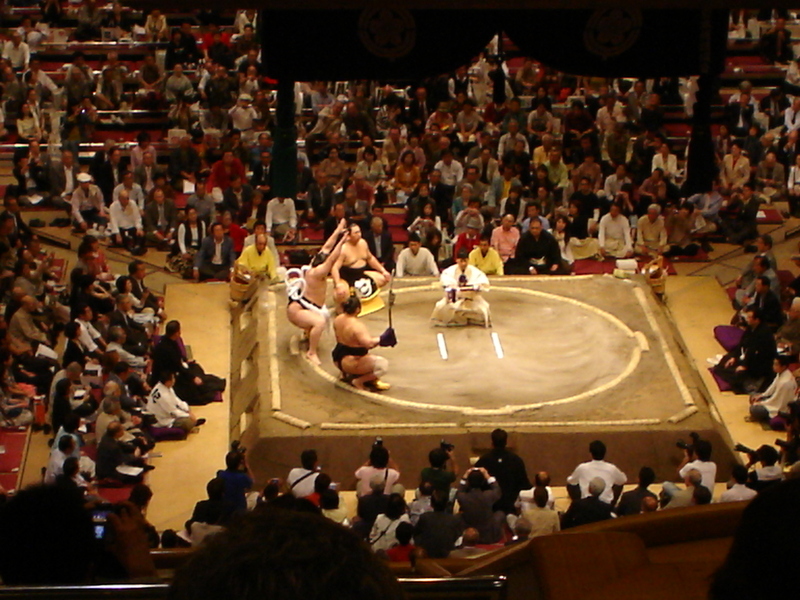 Harumafuji won. 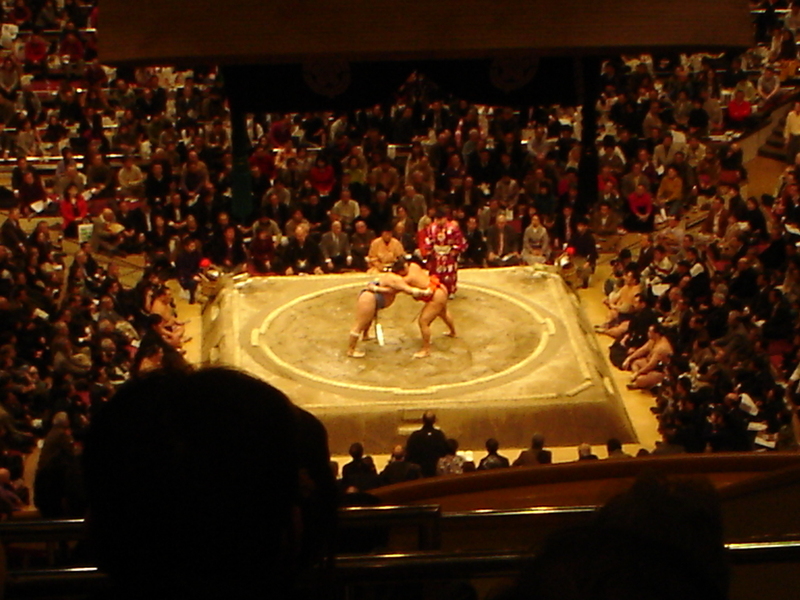 This is Wakanosato versus Ozeki Kaio. Kaio won this match. He's the oldest active sumo wrestler, and is very popular. He's been one of the longest Ozeki in history. 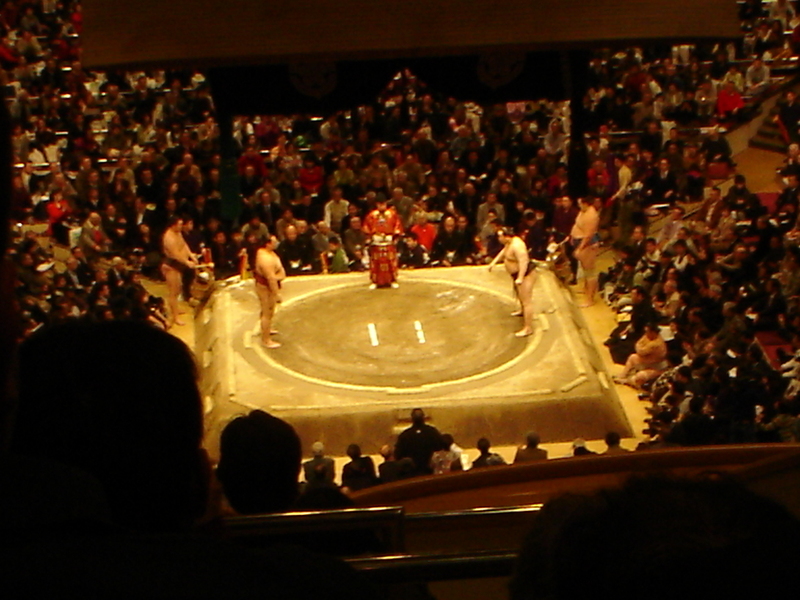 This is Ozeki Baruto versus Komusubi Kisenosato. 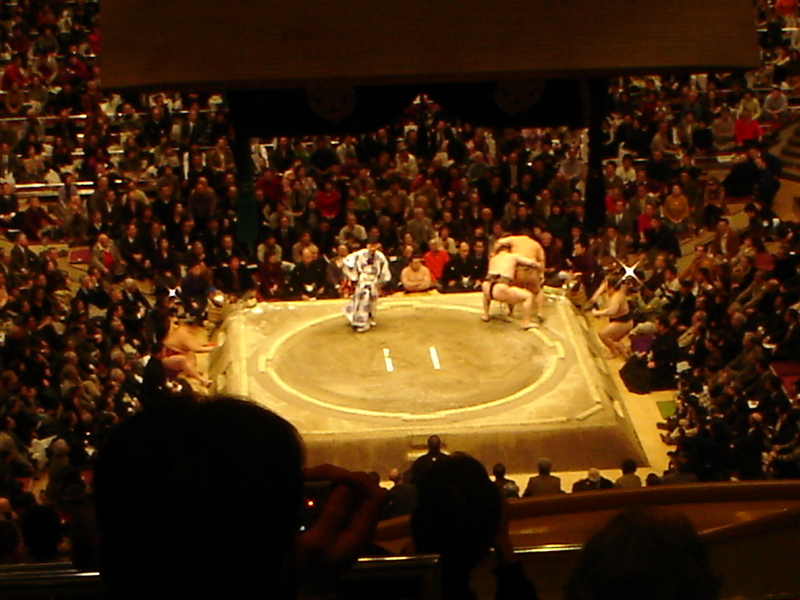 Kisenosato won. 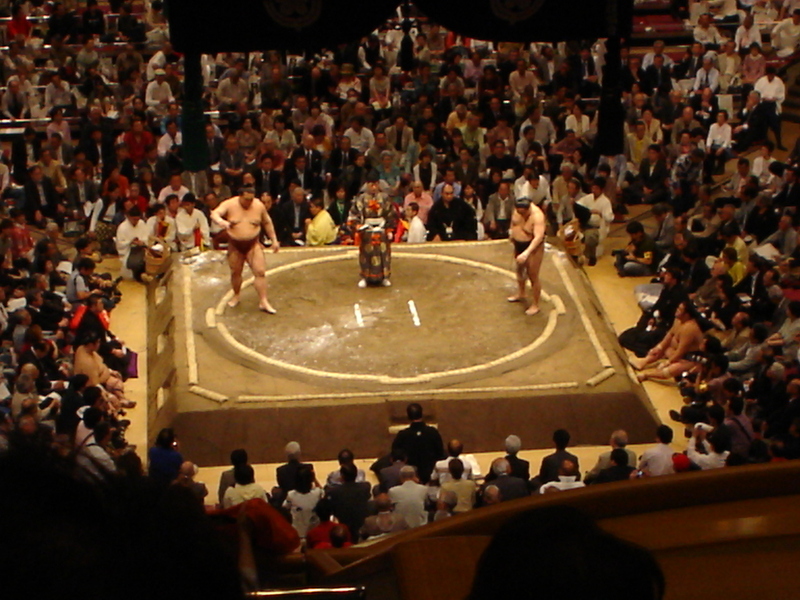 This is Komusubi Kakuryu versus Ozeki Kotooshu. Kotooshu won. Finally is Yokozuna Hakuho versus Tokitenku. These are some of the sponsors for this match, including McDonald's. They're still going through their preparations. Hakuho won this match. He's going for a record winning streak. Finally, here’s a video of Yobidashi singing near the main entrance as I was leaving. 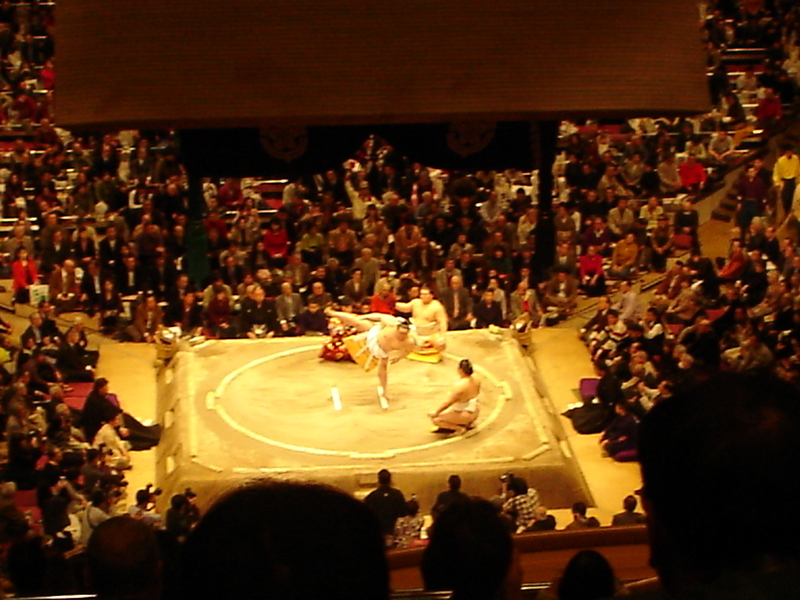 Yobidashi are the men who sing the names of the sumo wrestlers before their matches, basically acting as musical announcers. They also do other odd jobs around the ring. 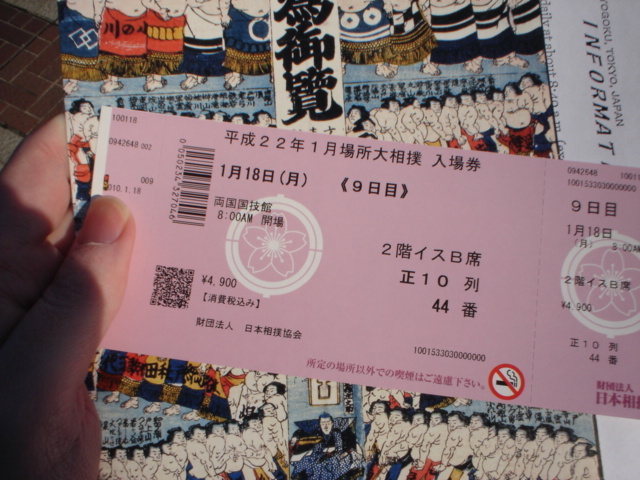 My quest to attend all three sumo tournaments in Tokyo continues. 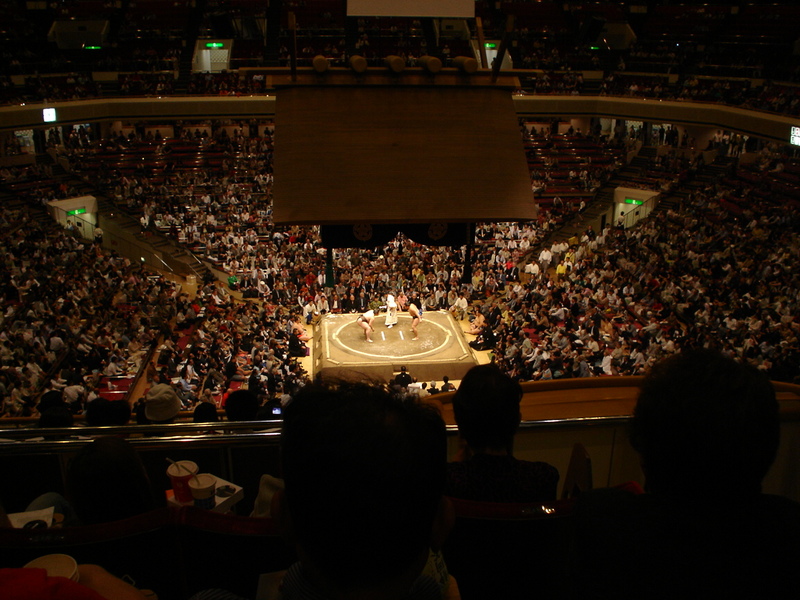 On May 17, 2010, I attended Day 9 of the spring tournament in Tokyo at the Ryogoku Kokugikan. It’s been nearly 2 months since then, but it’s about time I post these pictures. Today is the first day of the Nagoya tournament, so this is a good time. A lot has happened in sumo this year. Asashoryu retired after the January tournament because of yet another scandal. More recently is the baseball gambling scandal which has forced the retirement of Ozeki Kotomitsuki and Otake-oyakata of the Otake Beya (or stable). The NHK (Japan’s public TV station) is not broadcasting the Nagoya tournament because of the scandal. 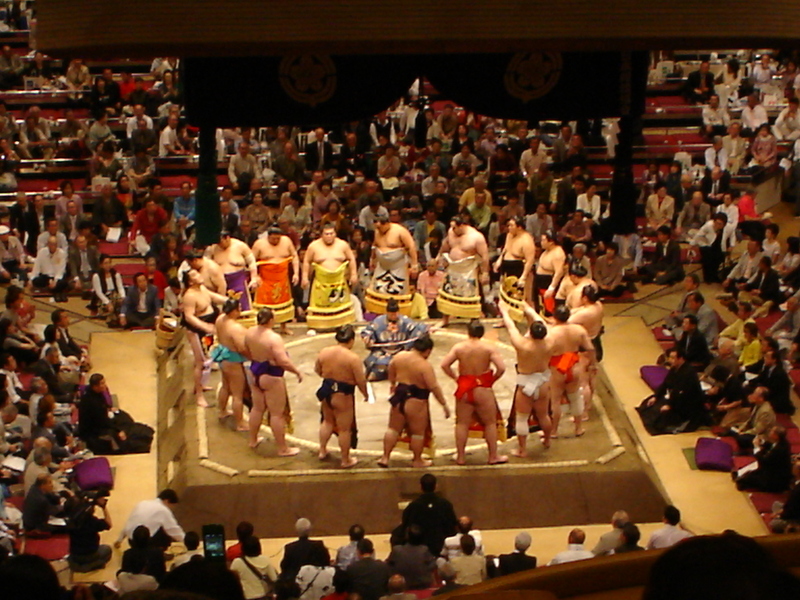 There are many other sumo wrestlers who are suspended for this month’s tournament and are under house arrest. Anyway, here is the May tournament’s pictures. 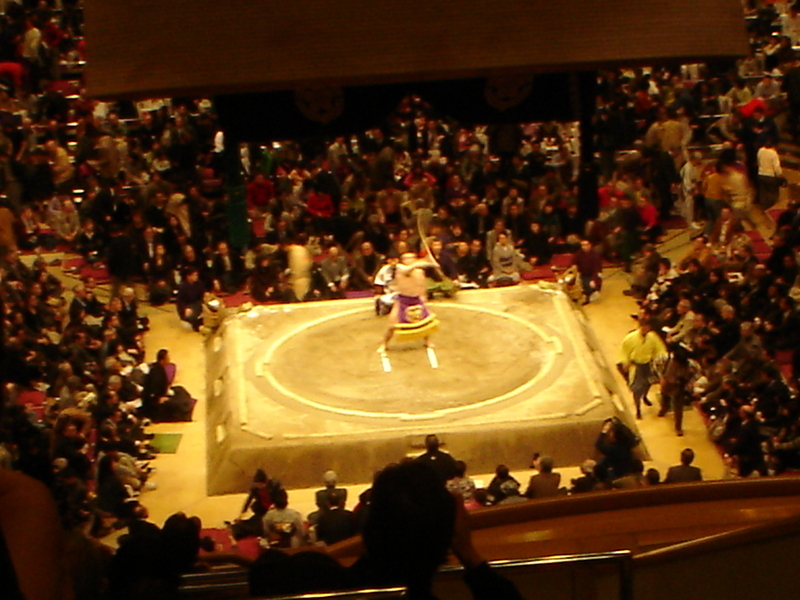 First, we start with a quick shot of a lower division match, then the entrance ceremonies of the top 2 divisions. 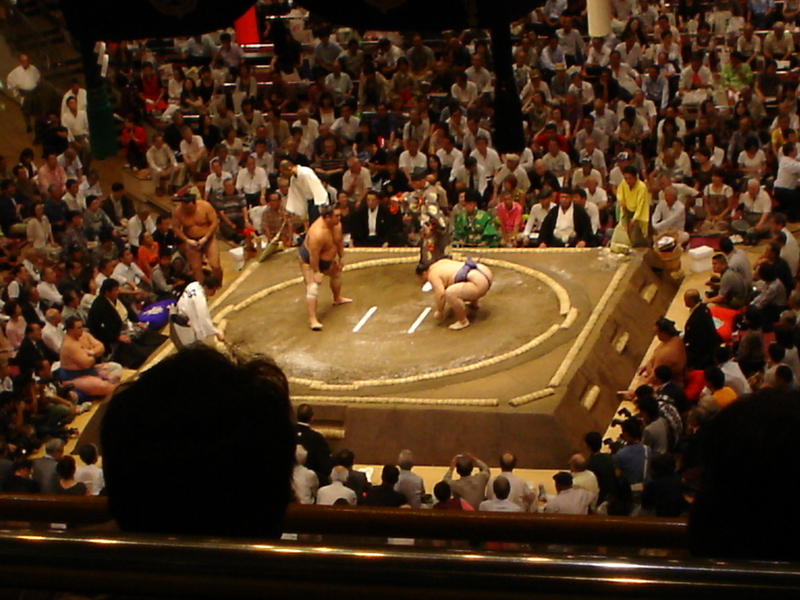 This is a lower division Makushita match. 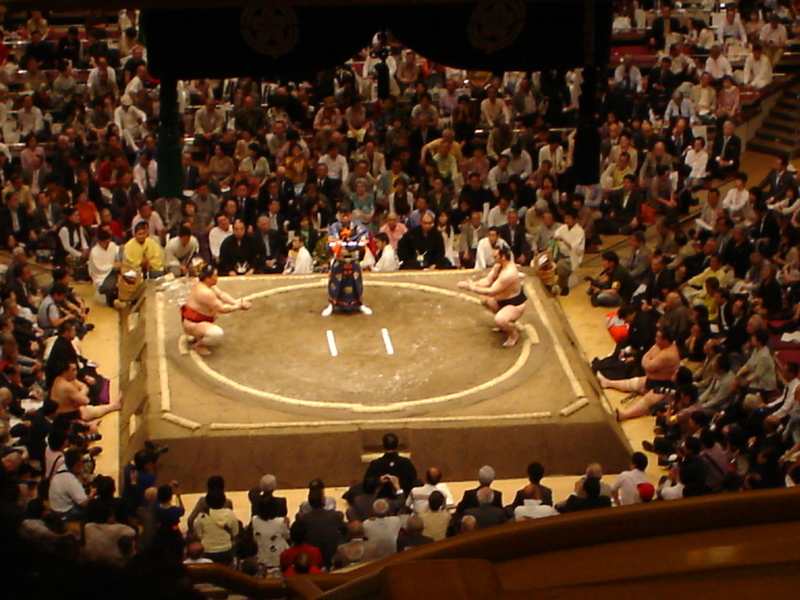 This is the entrance ceremony for Juryo division East. 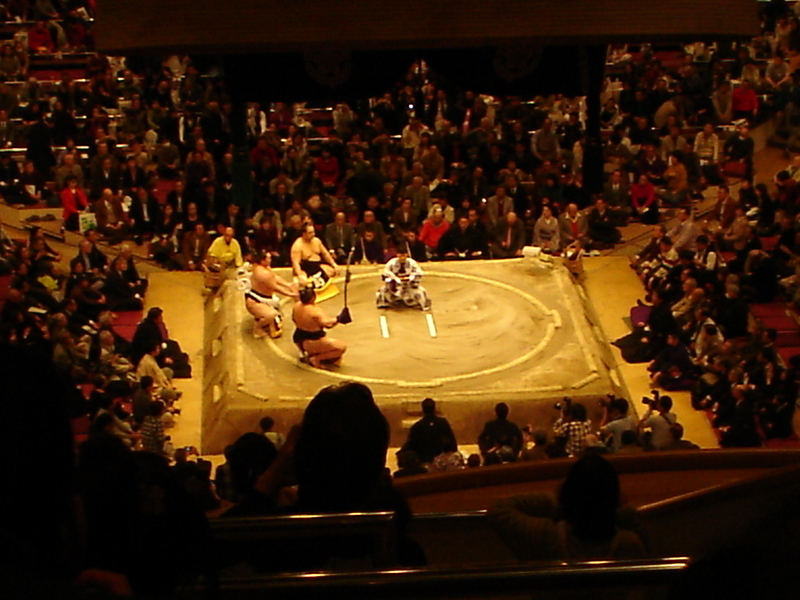 This is the entrance ceremony for Juryo division West. 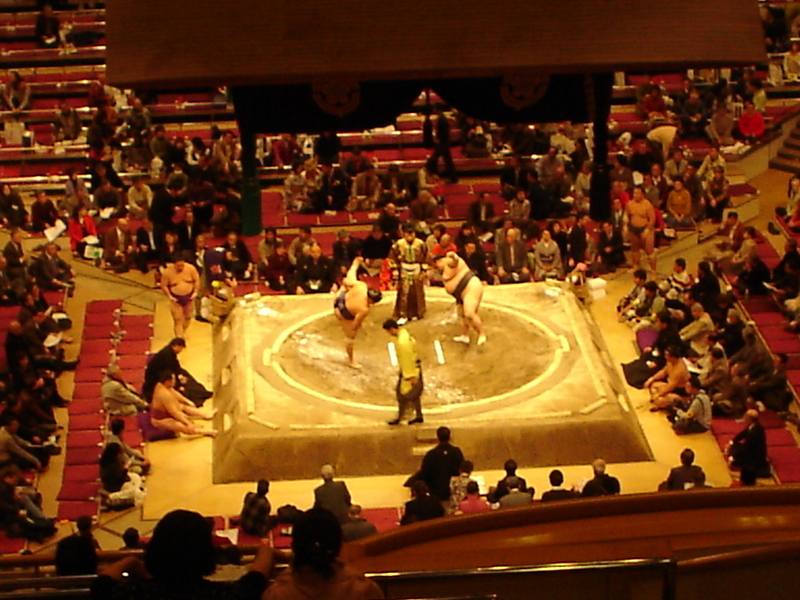 Here's the top division Makuuchi East entrance ceremony. 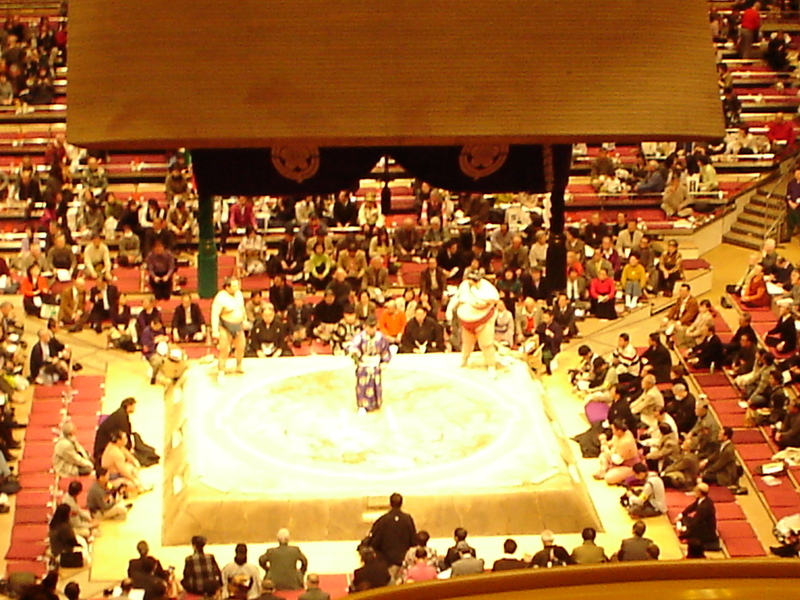 And here is the top division Makuuchi West entrance ceremony. 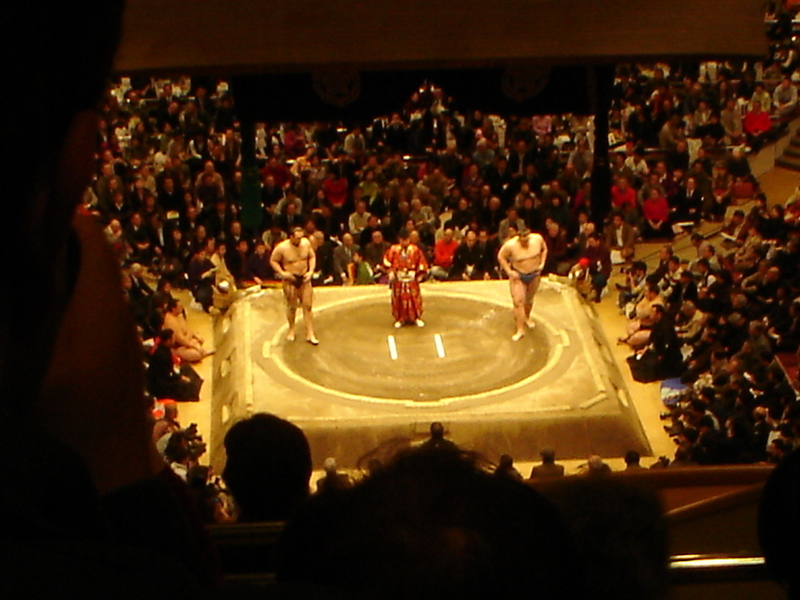 Here is Yokozuna Hakuho's entrance ceremony. Now Hakuho has a leg up. Hakuho is really low now. Hakuho has his leg up again. Now on to the top matches of the Makuuchi division. 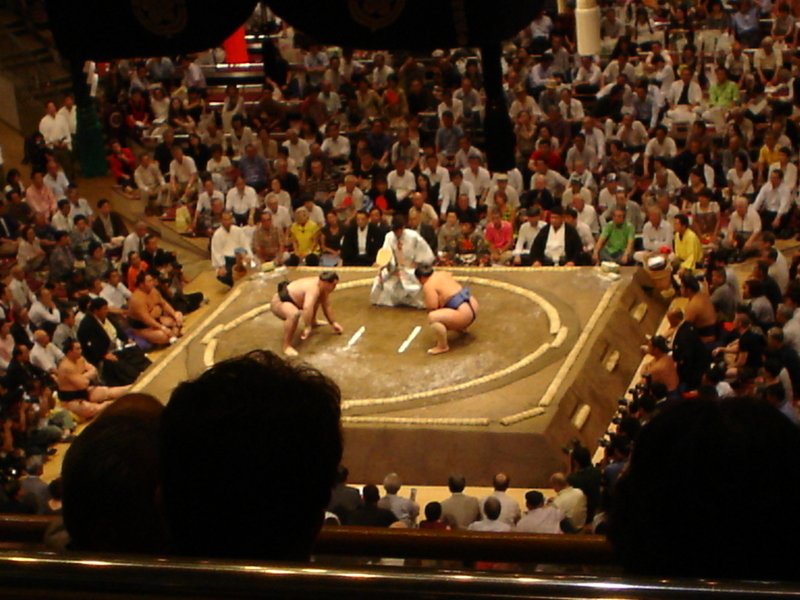 I’ve limited the pictures to Sekiwake matches and up. Sorry, no Takamisakari! 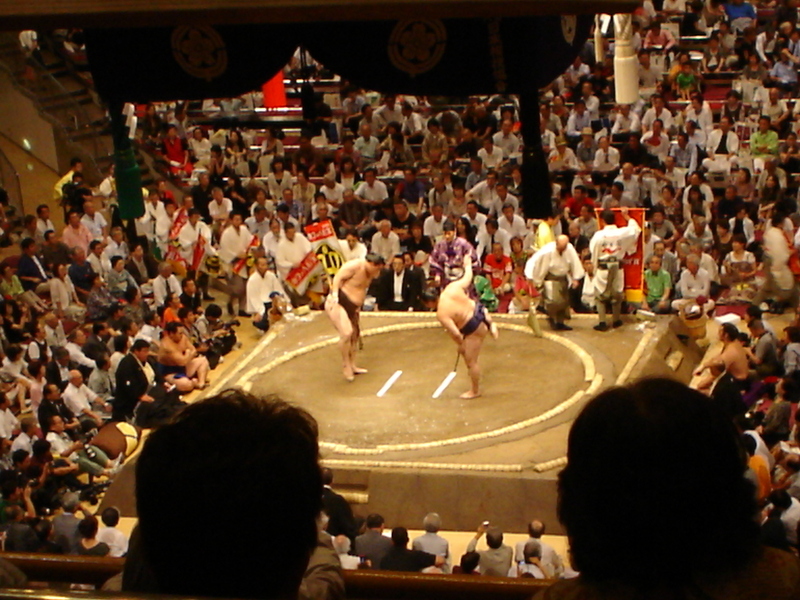 This is a bout between the two Sekiwake rikishi, Kisenosato (left) and Aminishiki (right). 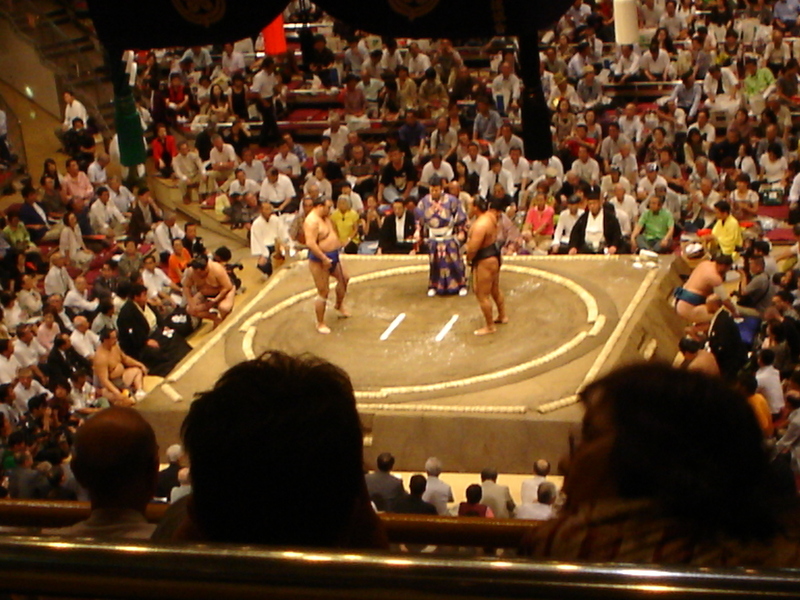 This match is between the now retired Ozeki Kotomitsuki (left) and Komusubi Tochiozan (right). 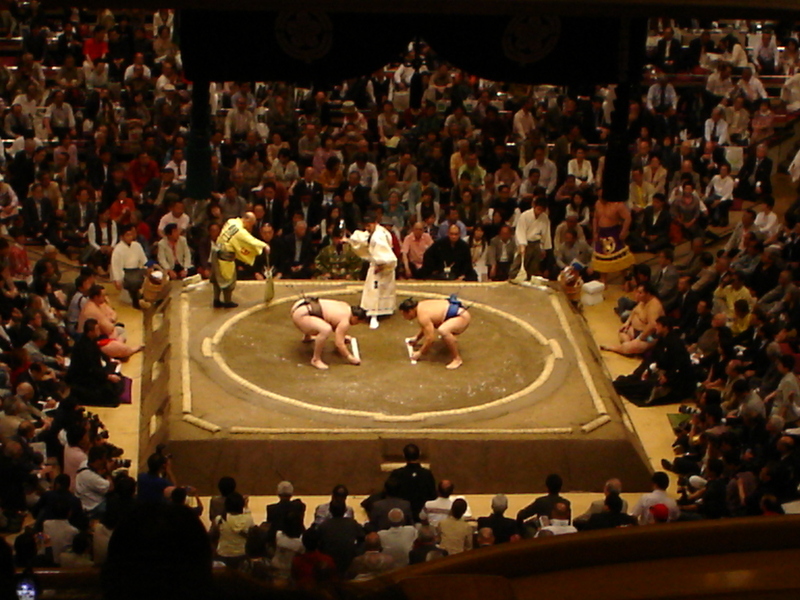 This is the match between Maegashira 4 Asasekiryu (left) and Ozeki Kotooshu (right). 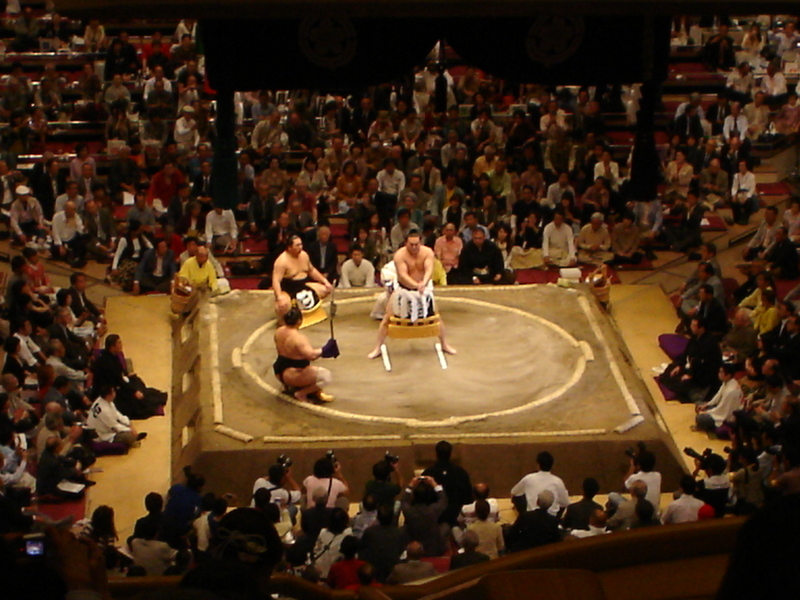 This is the match between Ozeki Harumafuji (left) and Maegashira 3 Wakanosato (right). 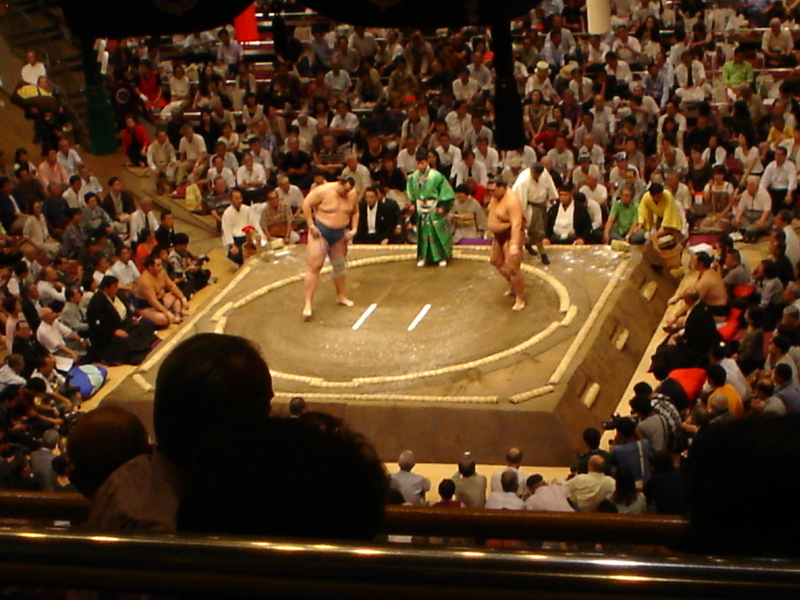 This match is between new Ozeki Baruto (left) and Ozeki Kaio (right). 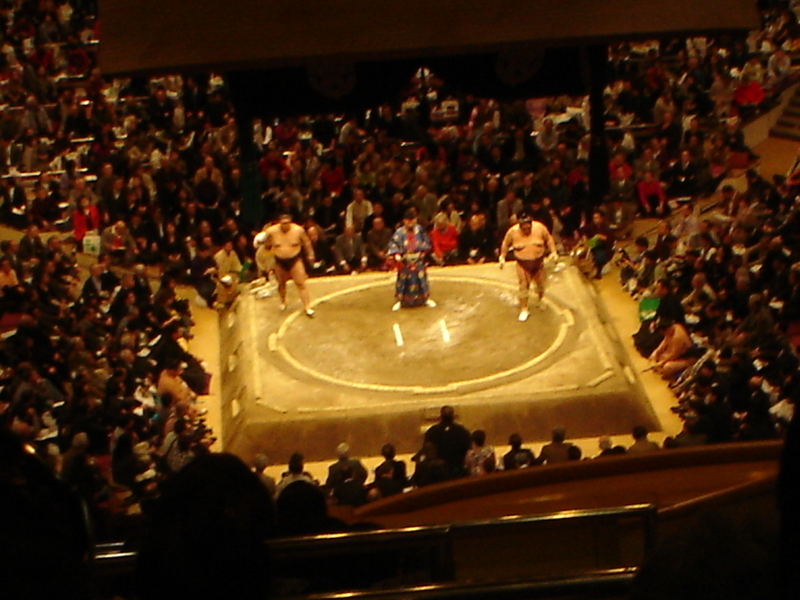 Finally, this match is between Yokozuna Hakuho (left) and Maegashira 3 Kakuryu (right). These are the sponsors for the match between Hakuho and Kakuryu. See McDonald's? More preparations before the match starts. 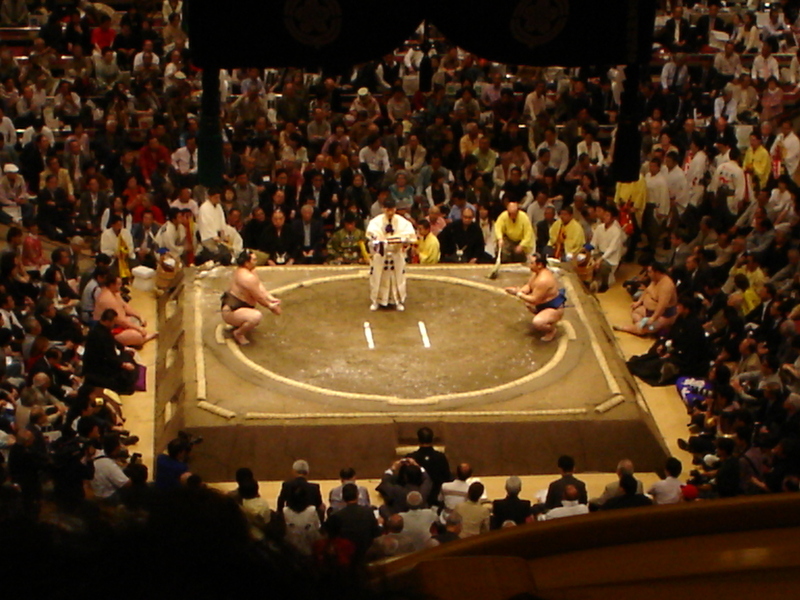 A wide shot of the arena just before the final match started. I enjoyed this tournament more than the January tournament. I had a good view, and no large-headed American was in front of me! I had some good conversation with the people sitting on either side of me, although it was all very simple Japanese. I’m looking forward to the September tournament! 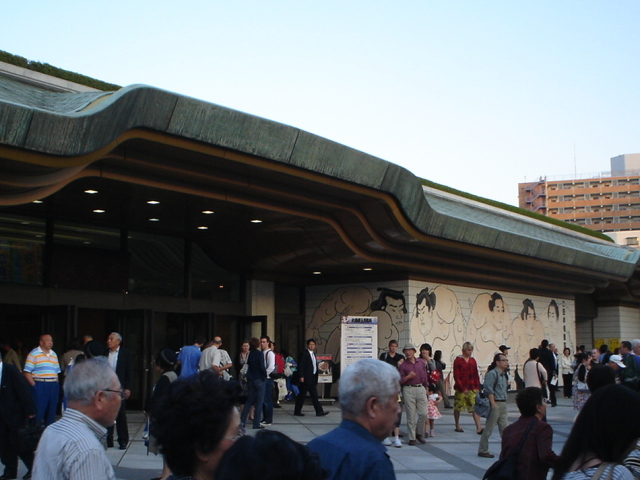 And now, some final pictures outside the Kokugikan. 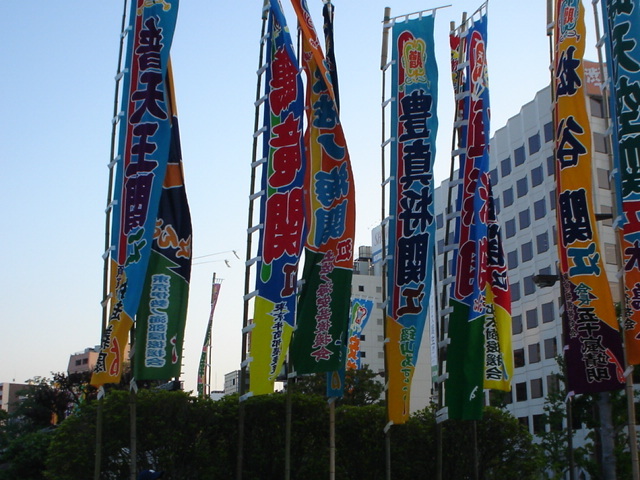 Here are some colourful banners outside the Kokugikan. 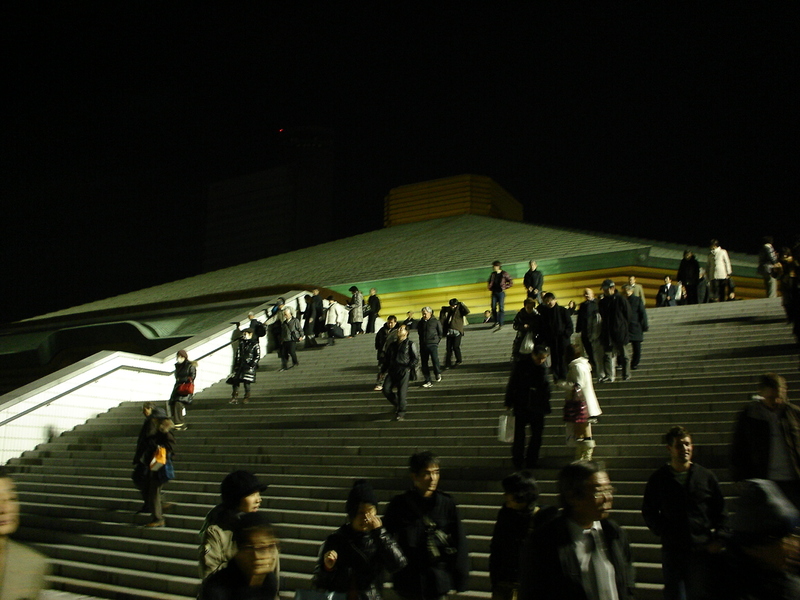 Lots of people are leaving the Kokugikan after the day's matches. 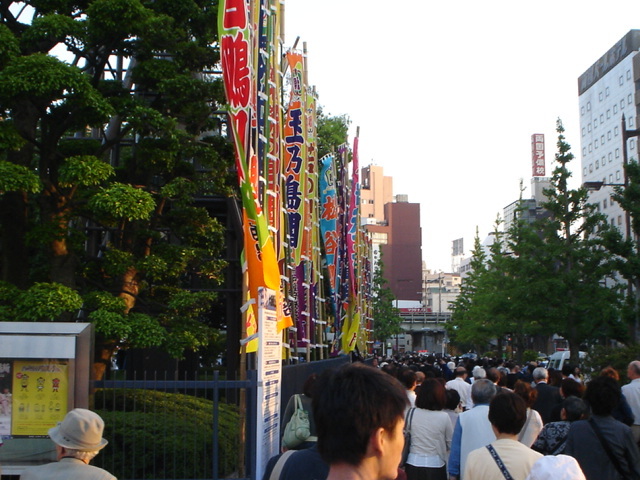 Look at all the people going toward Ryogoku station. 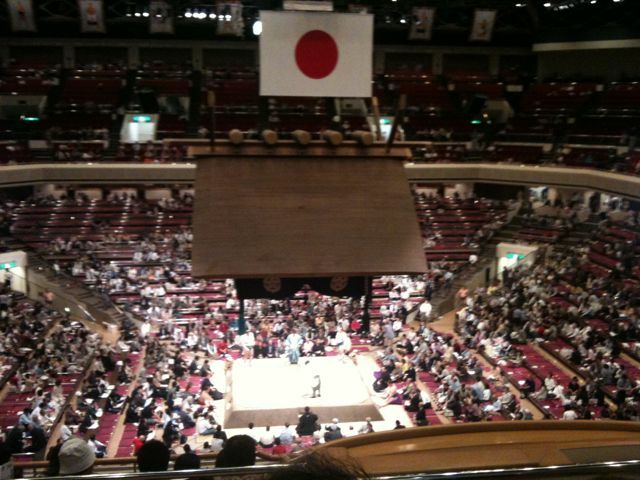 Here I am at Ryogoku Kokugikan again. 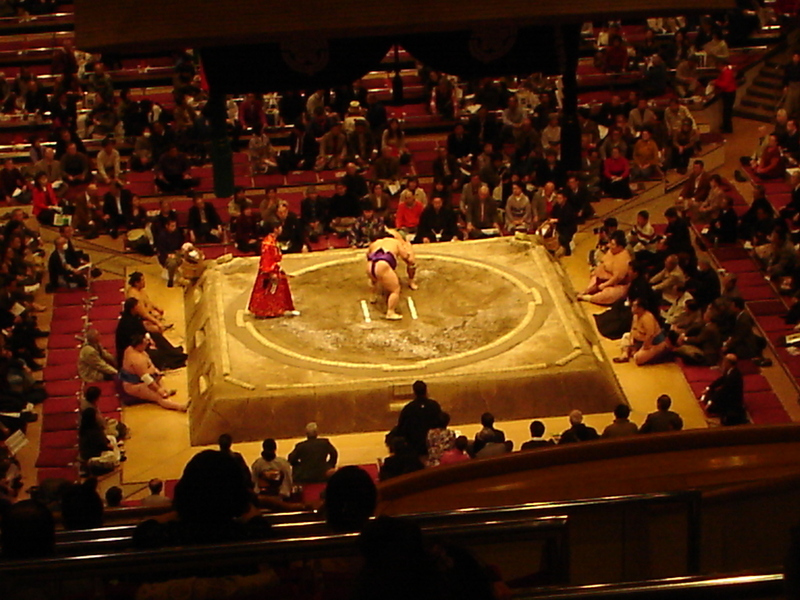 I’m watching sumo. I haven’t met any really famous retired sumo wrestlers, though. Two old ladies on both sides of me have been talking to me. One asks me about my favourite sumo wrestlers, while the other said her daughter is in Canada. I’m not taking many photos this time, but there are a few. 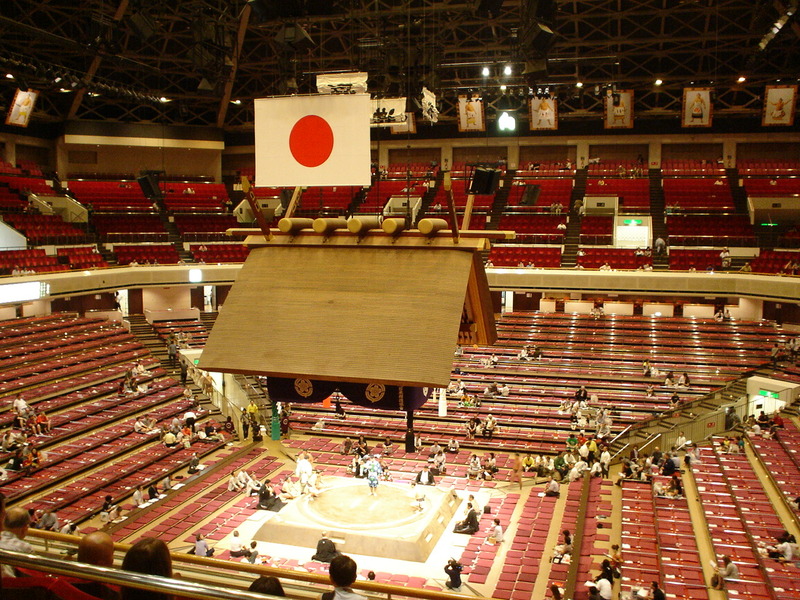 A wide view of the Kokugikan. 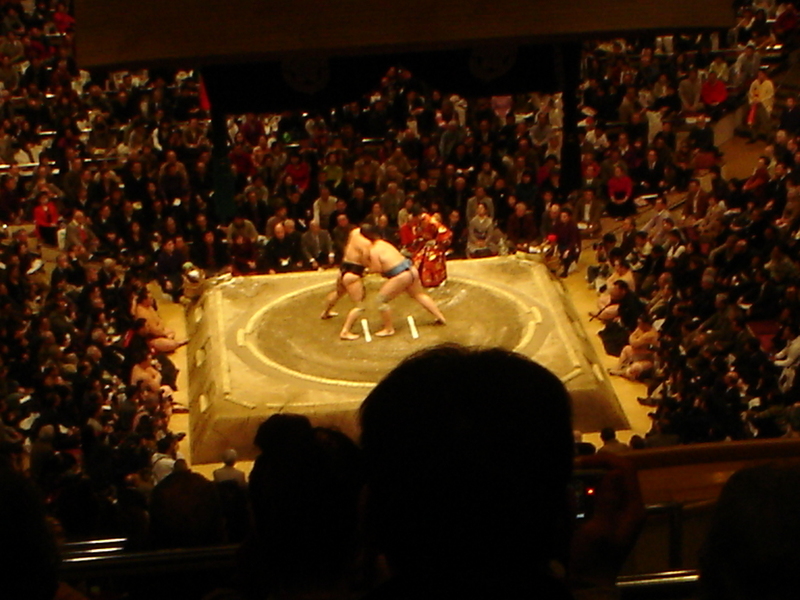 On January 18, I attended Day 9 of the sumo tournament in Tokyo. 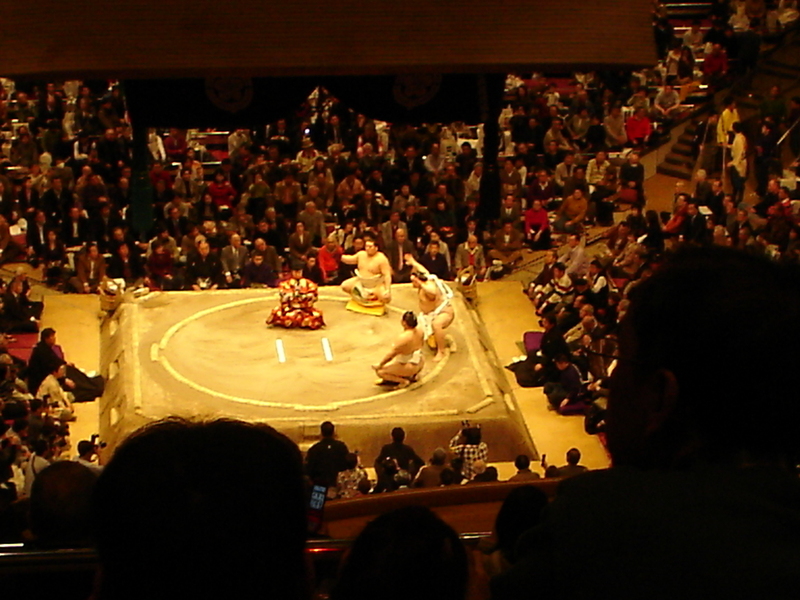 Sumo tournaments are 15 days long, and are held every 2 months (3 times a year in Tokyo, once in Osaka, once in Nagoya and once in Fukuoka). This tournament is special because Chiyotaikai retired after being demoted from the 2nd highest rank of Ozeki to the 3rd highest rank of Sekiwake. Even bigger is that after this tournament, Mongolian Yokozuna Asashoryu announced his retirement after yet another scandal involving his bad temper. But I’m not going to talk about that. Instead, I have some photos and a video to share. After taking all of these photos, I realised how badly I need a new camera. I hope to buy one in the next 2 or 3 months. 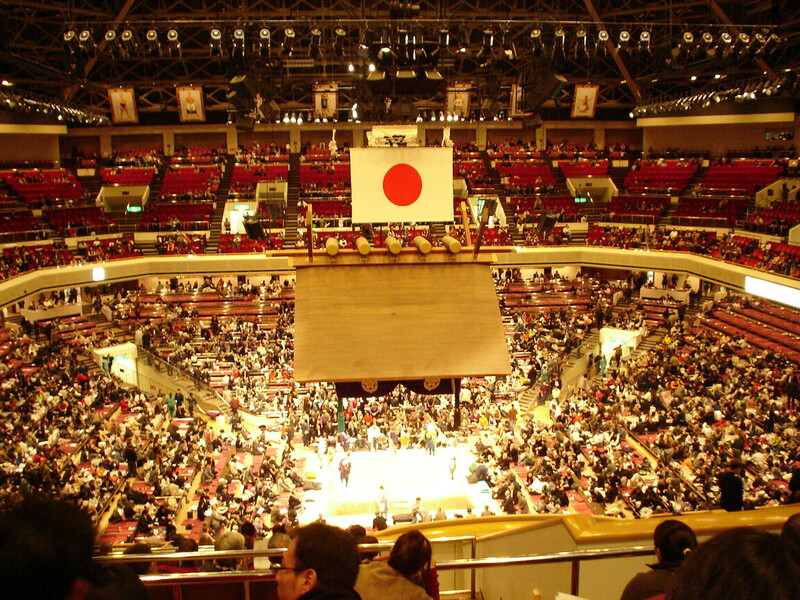 So, I arrived at Ryogoku station in Tokyo shortly after 2 pm and headed over to the Ryogoku Kokugikan, which is where the tournament is held. I’d be able to see the top 2 divisions in their entirety, plus some of the 3rd division (Makushita). 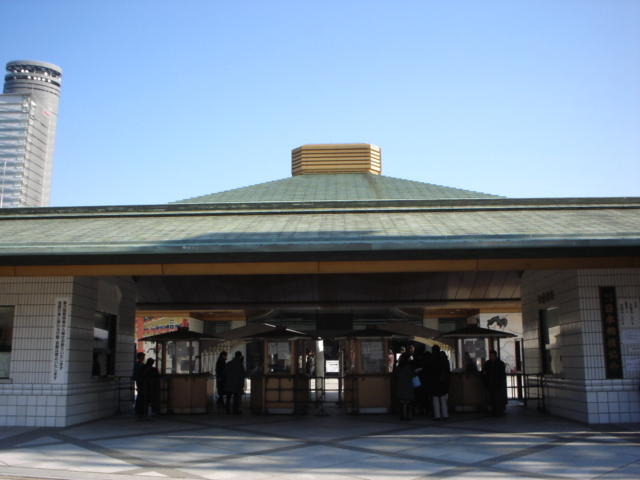 Here I am, outside the main ticket gate of the Ryogoku Kokugikan. And here is my ticket. 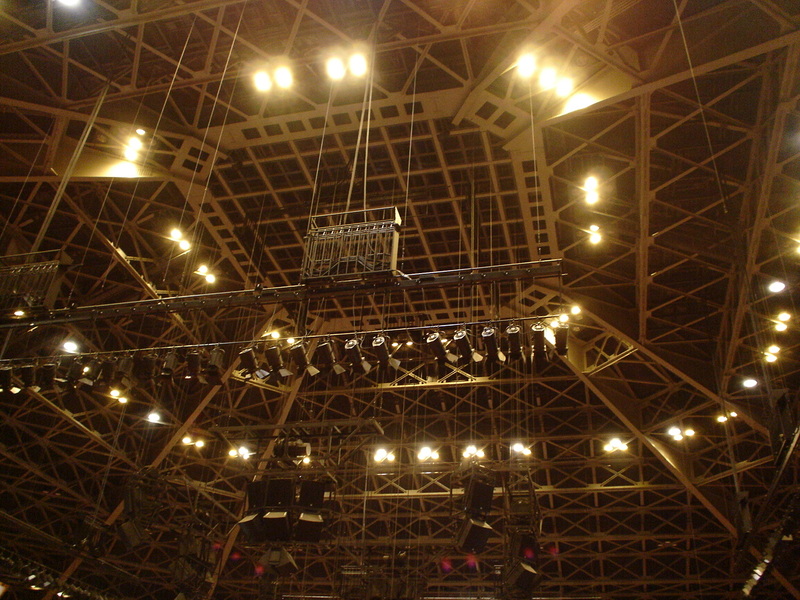 It's for arena seating, B section. It's decent, but next time, I want section A. 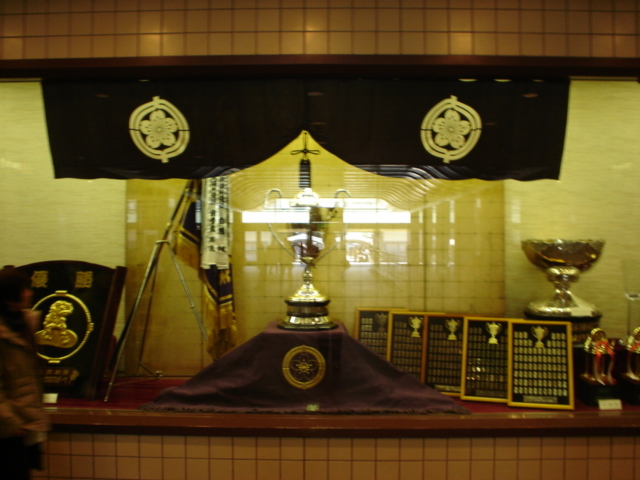 This is the awards display case just inside the Kokugikan. After finding my seat, I took this picture. This was my view. It was a very good position! 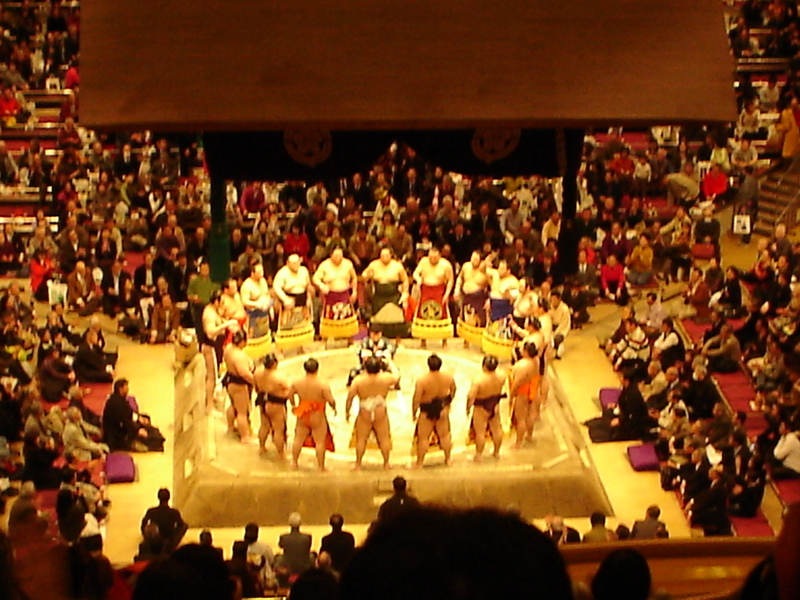 At this point, the Makushita division was competing. Not many people were watching, as everyone comes for Makuuchi, the top division. However, it was interesting seeing some of the up and comers. I was hungry at this point, so I went to get something to eat. On my way back, I met Musashimaru! He’s a former Yokozuna, and currently a coach. He’s from Hawaii, so speaks perfect English. I went up to him and asked him how he was. He said, “Oh, I’m fine.” Then I went back to my seat after telling him it was nice to meet him. Here's a Makushita division match. I don't remember who they were. 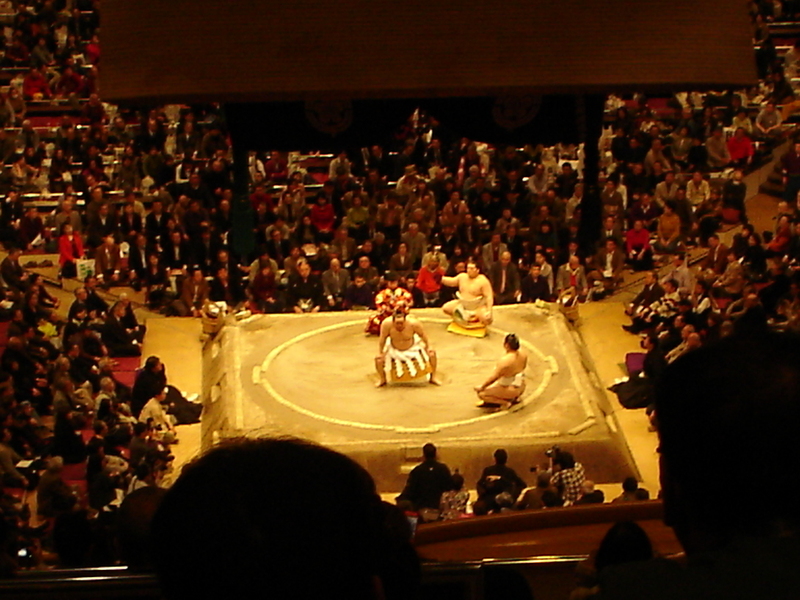 This is the Juryo division entrance ceremony. 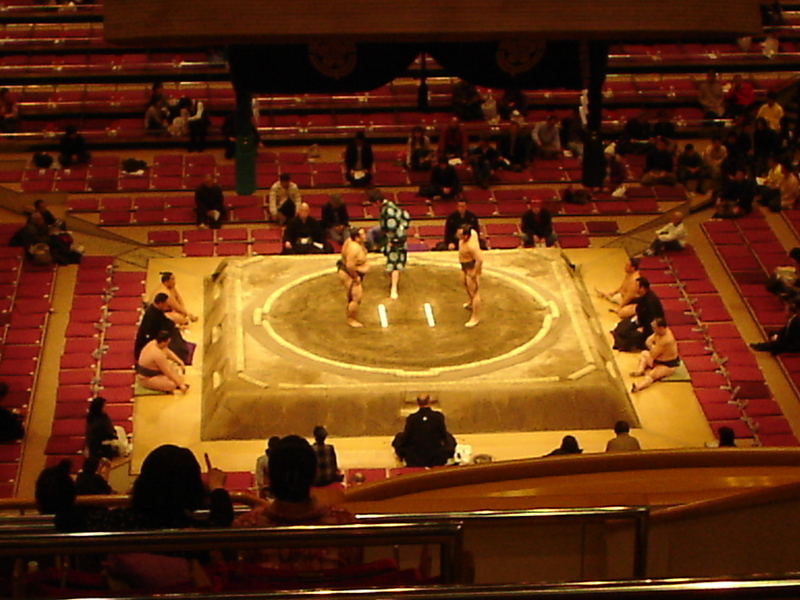 These two Juryo division wrestlers are doing their ritual preparations. I guess you could call this the scoreboard. 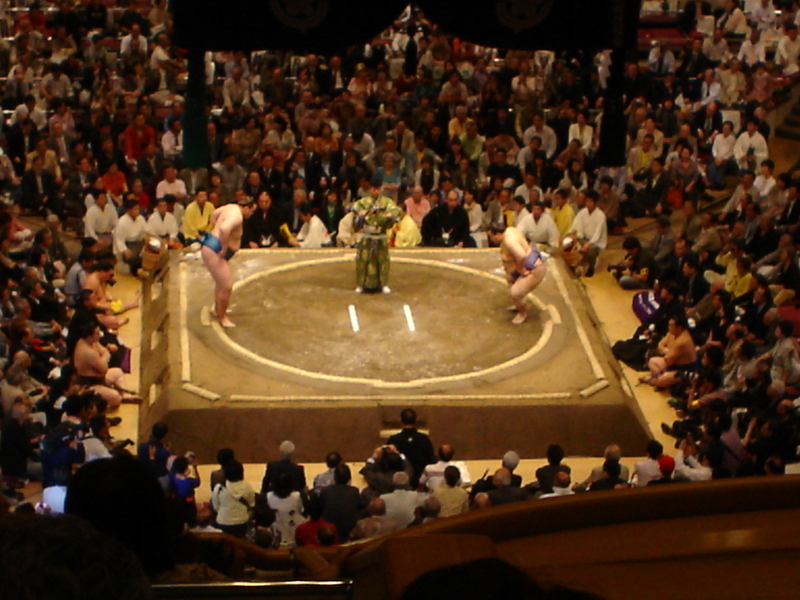 It lists all the matches of the day in Juryo and Makuuchi and who won. Here are 2 more preparing for their match. On the right is Yamamotoyama. He is the biggest sumo wrestler at the moment. He is very heavy and not at all graceful. Yamamotoyama has lost! Don't worry, the judge below him escaped. I’ll take a moment here to describe the people who were sitting around me. On my right were an elderly couple. On my left was a group of middle aged people. In front of me was an American with a big camera. He was tall, and he kept leaning forward, making it difficult for me to see. Here was my view. Notice how his head was perfectly placed to obstruct my view. 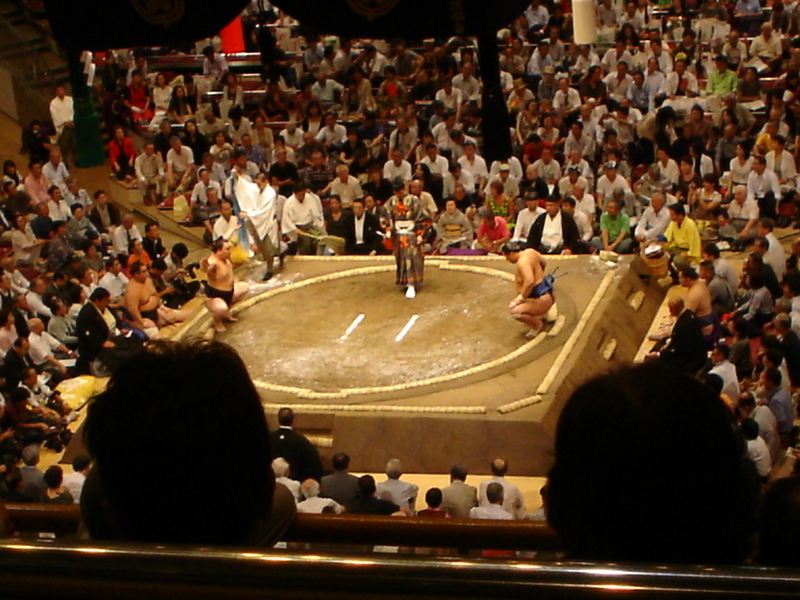 The Juryo division has finished, and now it’s on to the Makuuchi division. There are 42 wrestlers in this division. At the top is Yokozuna. 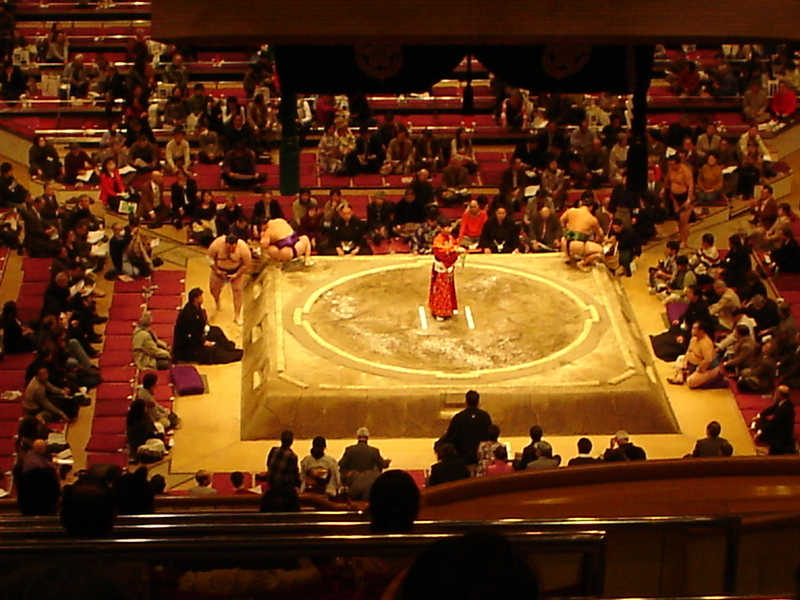 At the time of this tournament, there were 2, Hakuho and Asashoryu, both from Mongolia. However, Asashoryu has since retired. Next is Ozeki, of which there are 4. 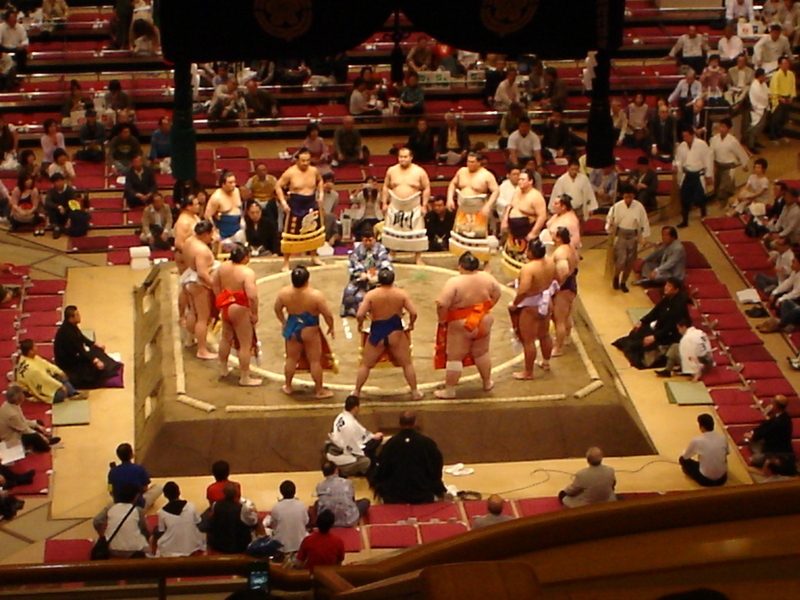 They include Kotooshu (the popular Bulgarian), Harumafuji (the very talented Mongolian), Kotomitsuki (a mediocre Japanese Ozeki who had withdrawn earlier) and Kaio (the old guy, a longevity record-breaking Ozeki who is quite popular and has a very strong arm). 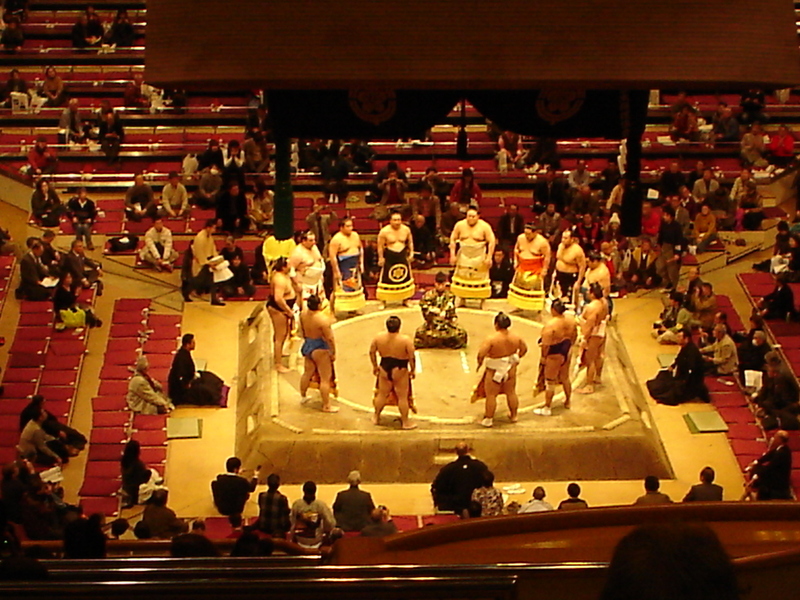 Then it’s Sekiwake, of which there are 2, including Baruto (a young, tall Estonian) and Chiyotaikai (the former Ozeki who had retired earlier in the tournament). And then it’s Komusubi, of which there are 2, including Kotoshogiku (a promising Japanese sumo wrestler) and Kakuryu (a young Mongolian). The rest are all Maegashira. 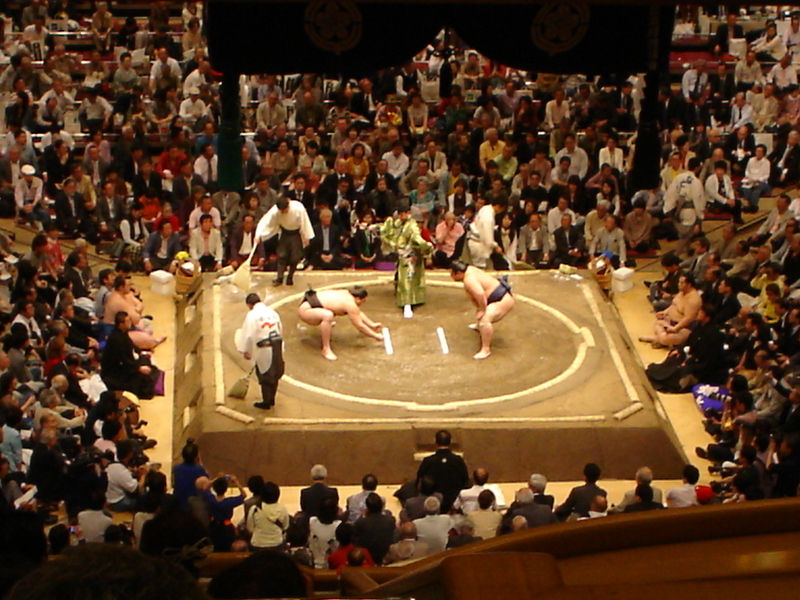 The very popular Takamisakari is a Maegashira, and he’s known for his arm pumping at the beginning of his matches. He’s also on commercials a lot. Well, back to the pictures. 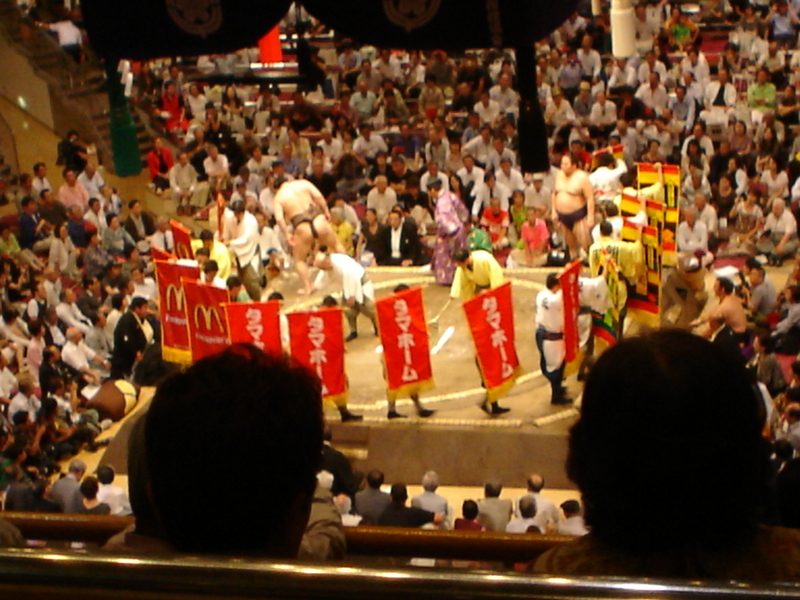 At the beginning of the Makuuchi matches, there is an entrance ceremony. This is the other half of the entrance ceremony. Now it's the Yokozuna entrance ceremony. First up is Hakuho. 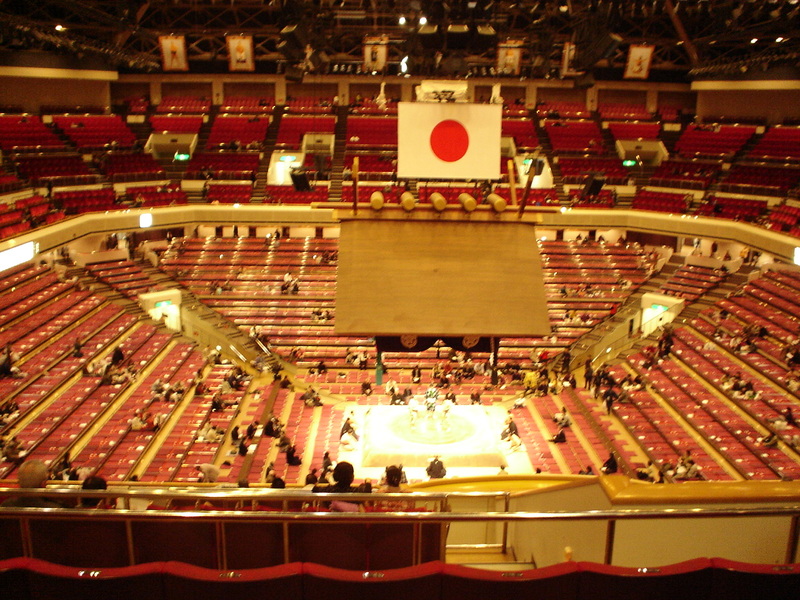 Next is Asashoryu's entrance ceremony. Although many people don't like him, people seem to love watching him. He has a lot more flair than Hakuho. Asashoryu is lifting his leg high up in the air. And now his leg is down. 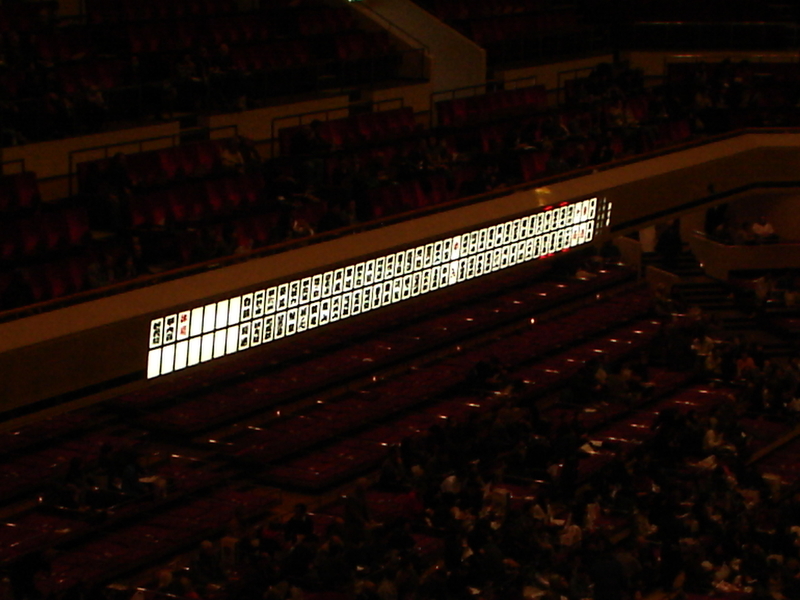 Now a look at the overall view of the Kokugikan. A lot more people now. It's not full, and it never is on a weekday. It sells out for weekends, though. 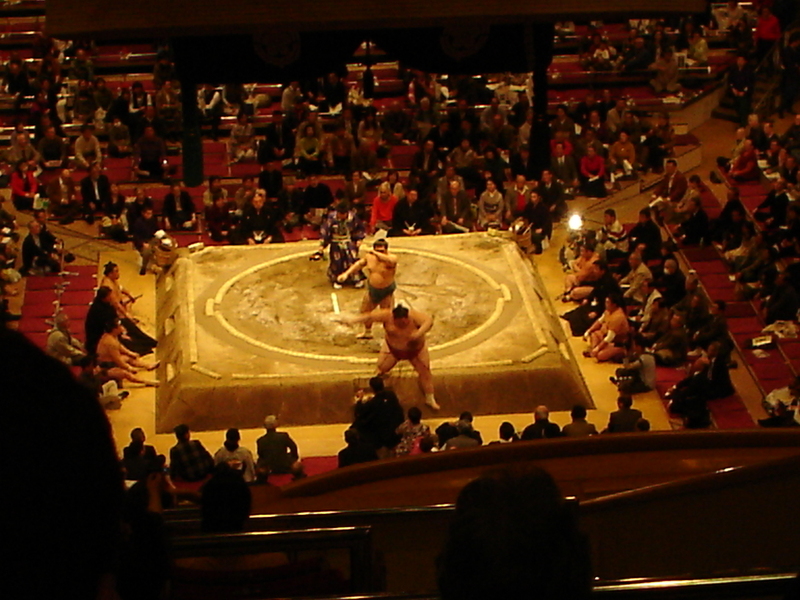 Here is a video of Takamisakari versus Tochinonada. Takamisakari is on the left. Watch and listen around the middle when he pumps his arms. Sorry for the video quality. Here are two very good sumo wrestlers. 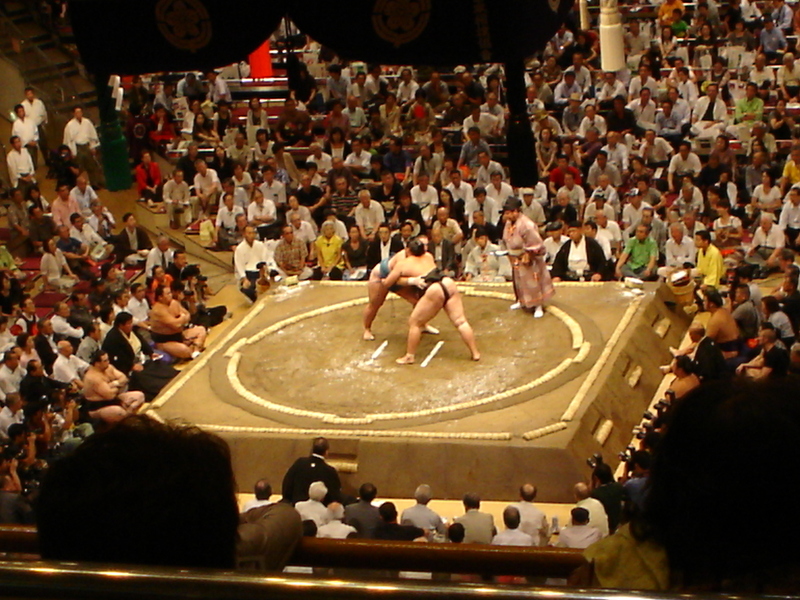 Goeido is on the left, and he's expected to be the next best Japanese wrestler. 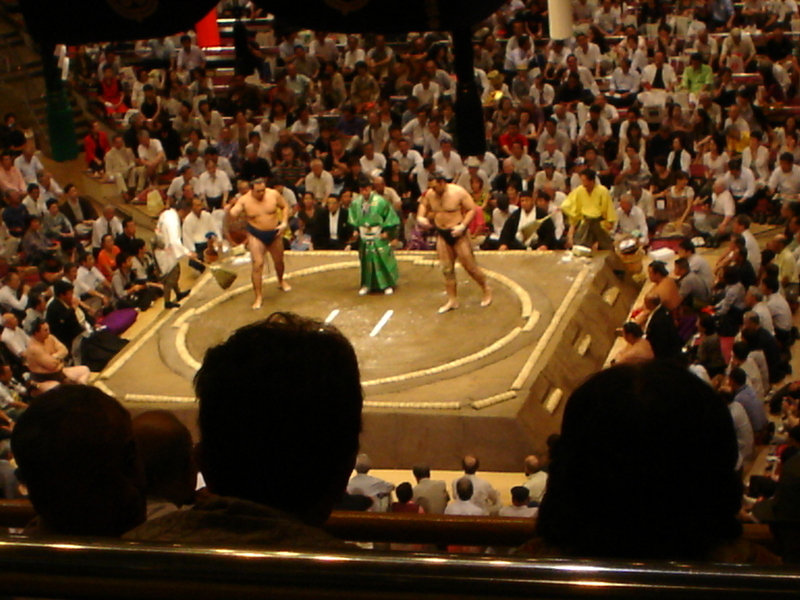 On the right is former Ozeki Miyabiyama. We're nearing the end of the tournament, which is when the top wrestlers compete. Here are two very tall Eastern Europeans, Ozeki Kotooshu (left) and Sekiwake Baruto (right). Kotooshu and Baruto are locked together. However, Baruto beats his senior. And now the final two matches. 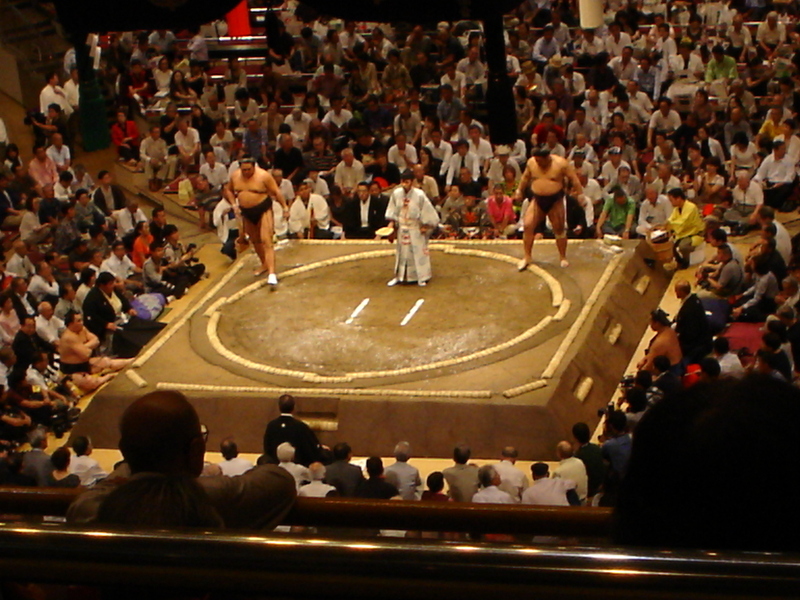 First is Yokozuna Asashoryu vs Kisenosato, who is a very talented and strong competitor. When they were down like this, they stared at each other for a long time. 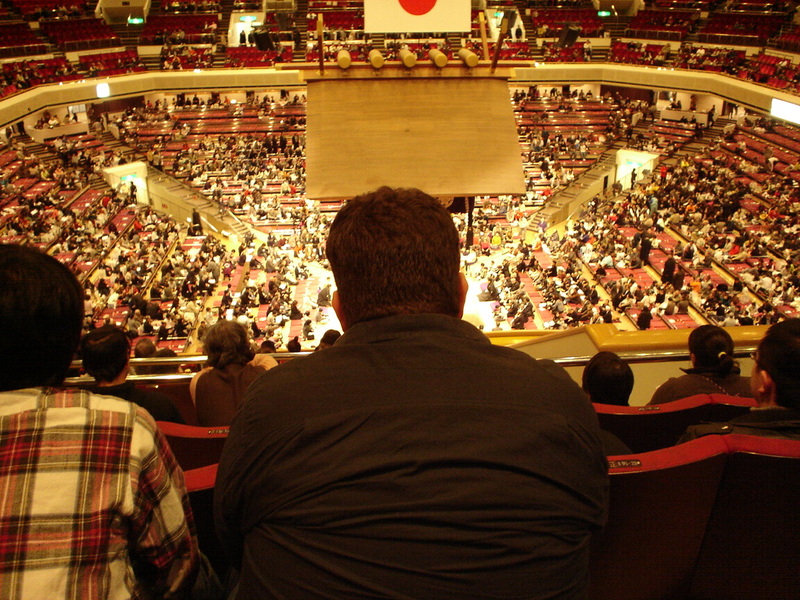 Kisenosato is not intimidated by Asashoryu. 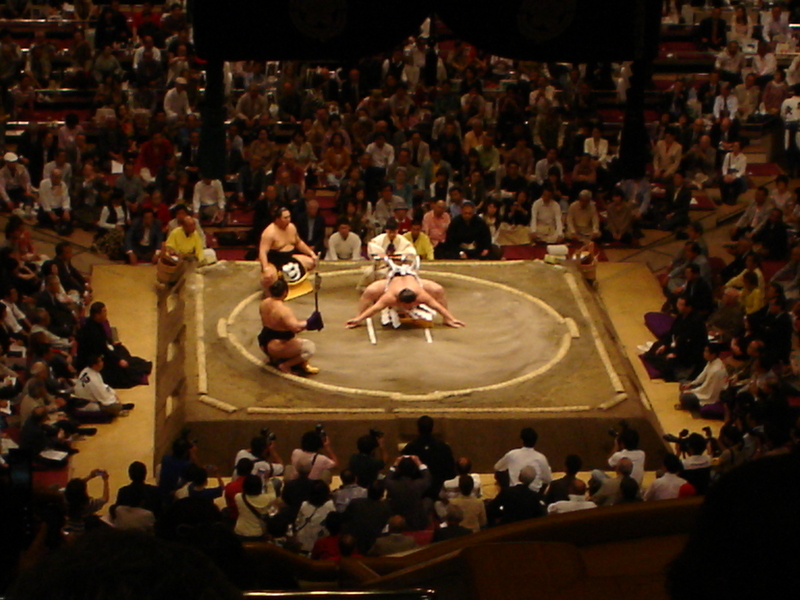 The final match features Yokozuna Hakuho and the unimpressive Kakizoe. And Hakuho is the winner! Finally, after all the matches have been completed, is the bow dance ceremony. One last look at the Kokugikan as I leave to go home. 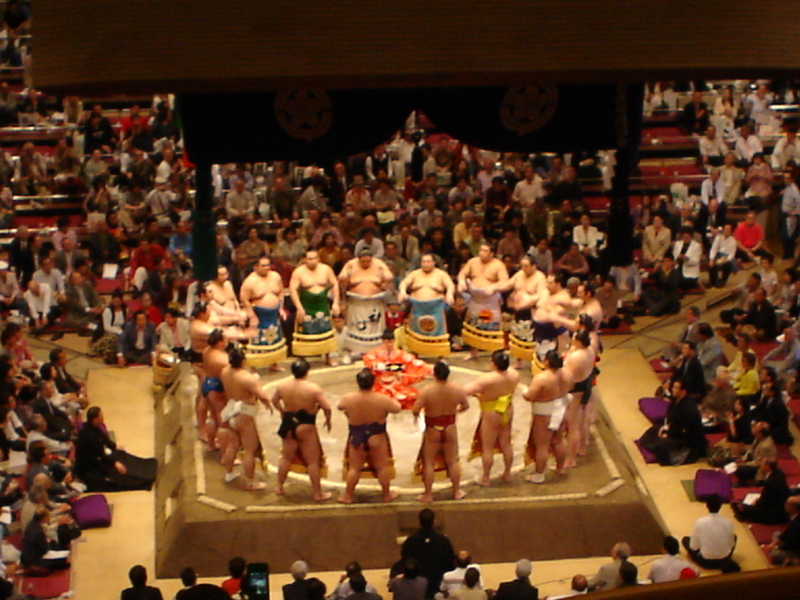 The Grand Sumo Tournament was fun. 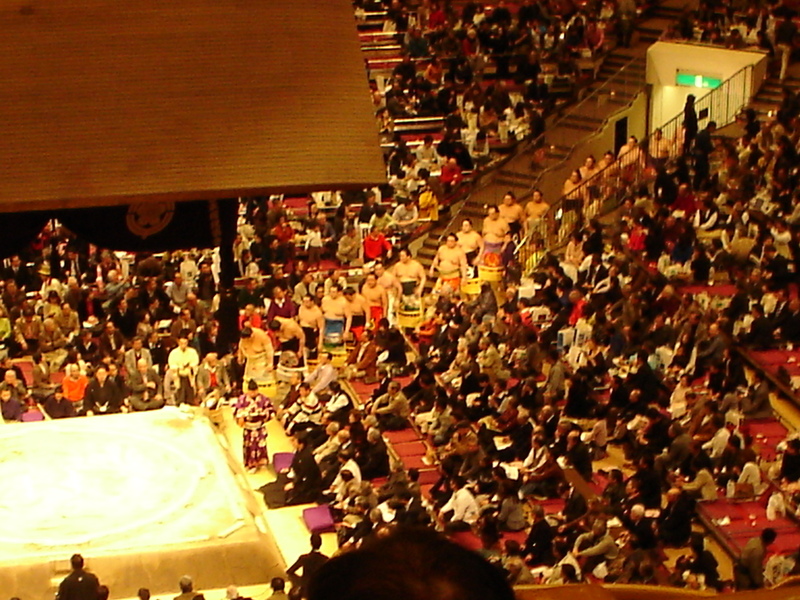 It took me nearly 5 years to finally attend a sumo tournament, and I wasn’t disappointed. I liked it so much, I’m going to try attend every tournament in Tokyo. The next one is in May!